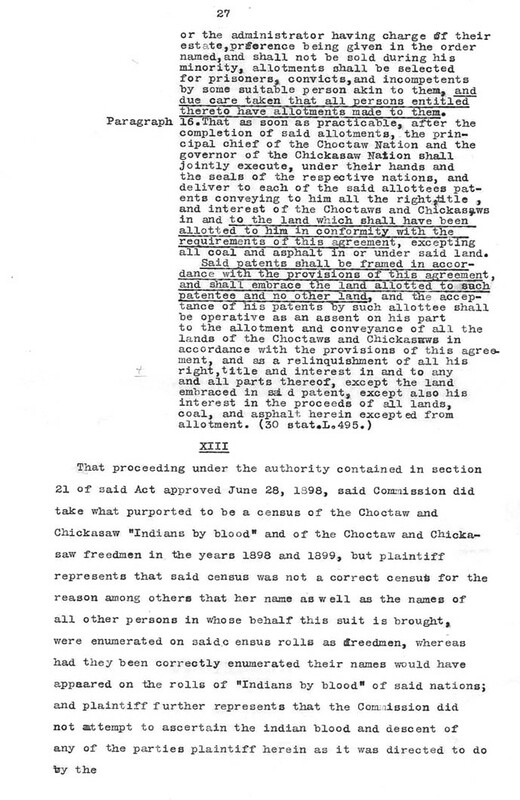 The Freedmen were relentless in exerting their position that they were entitled to the rights as citizens. 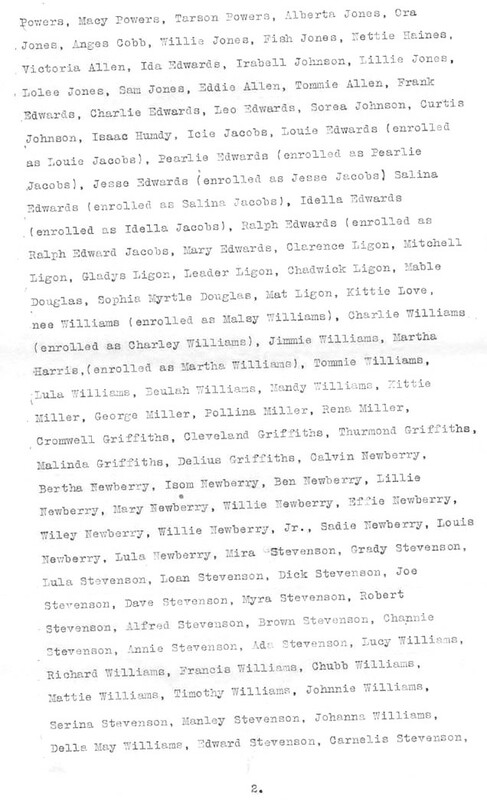 The Stevenson Family was particularly diligent in this quest. 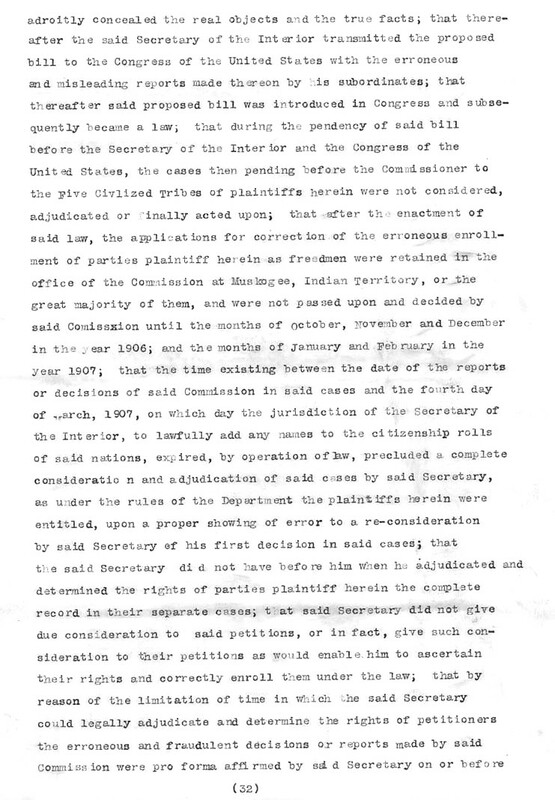 Sometime prior to 1847 a case was filed with a lower court. 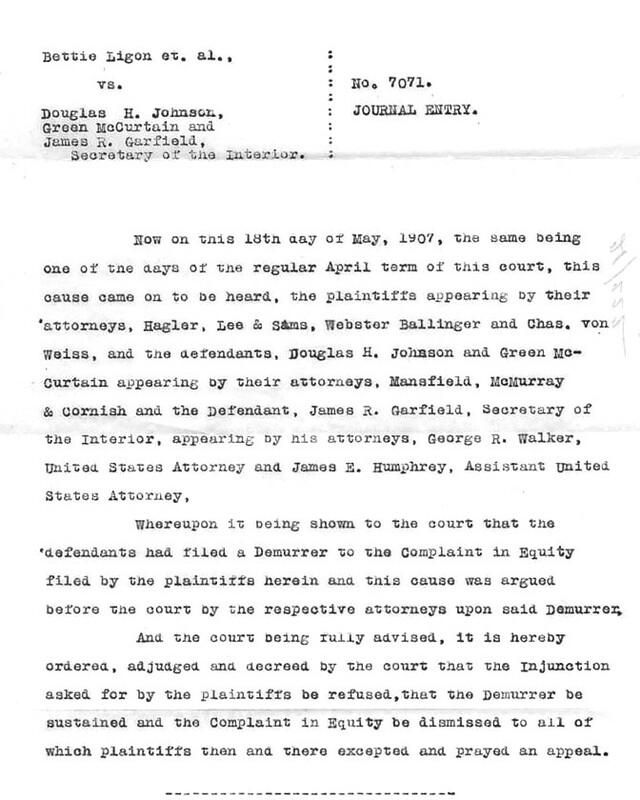 This original case has not been found and may have burned in a fire which occurred at the Lamar County Courthouse in Paris, Texas. 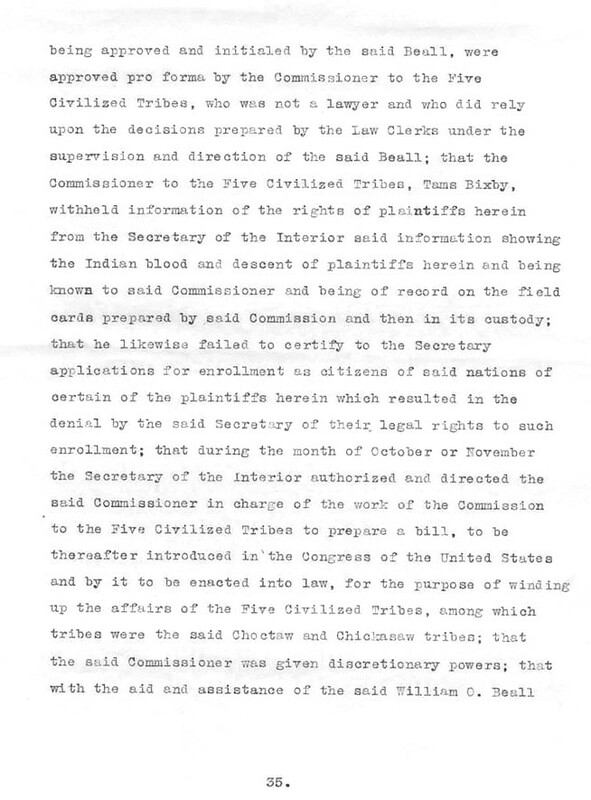 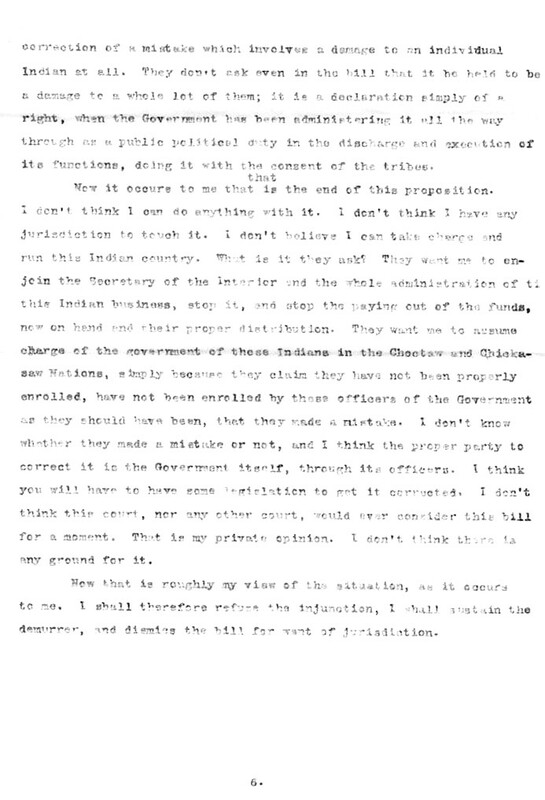 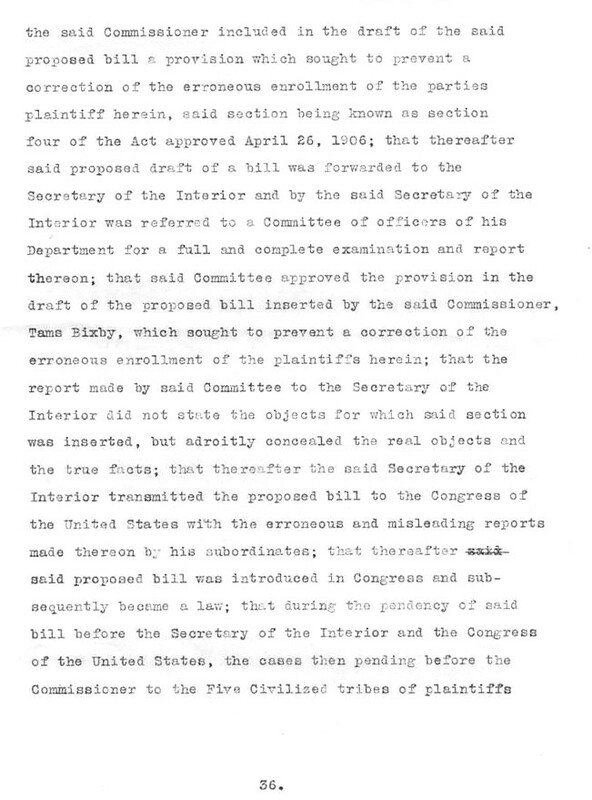 Lanie Colbert Stevenson alludes to this case during the final enrollment process when she testifies “that a good many years ago she was examined before a council or court as to her Indian blood, and that on that occasion she was duly placed upon said record as a Chickasaw Indian by blood, that she is the daughter of James COLBERT, who was a full blood Chickasaw Indian.” Below is the 1847 Texas Supreme Court Appellate Case. 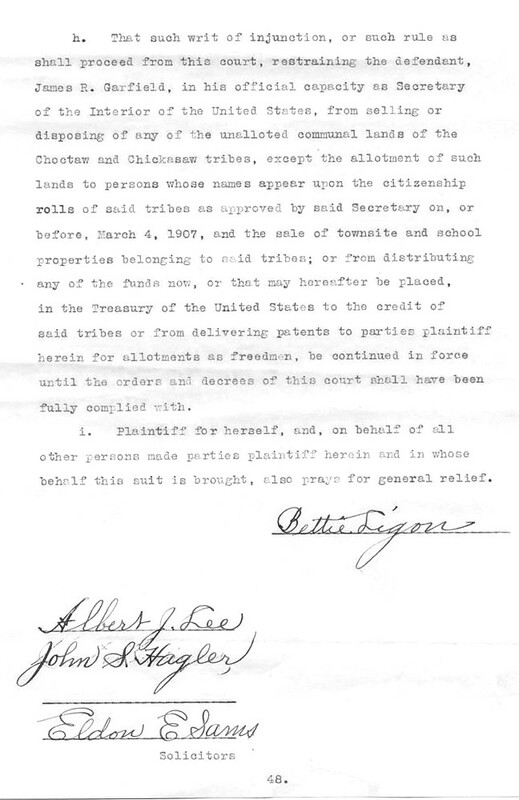 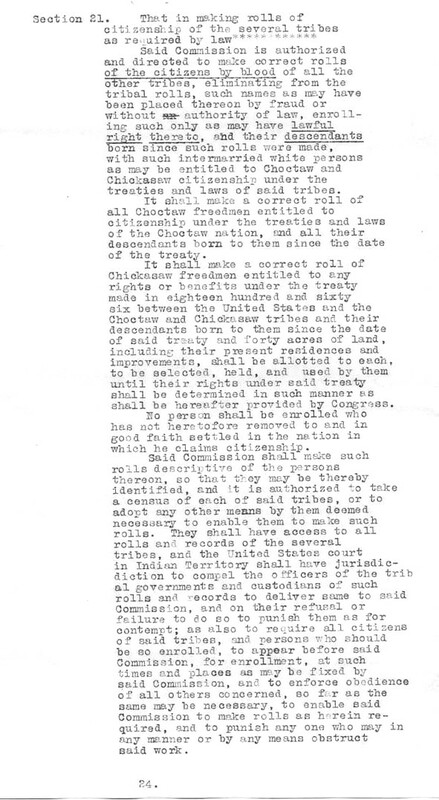 In 1907 the children (and descendants) of Lanie Stevenson filed a court case with the United States Supreme Court. 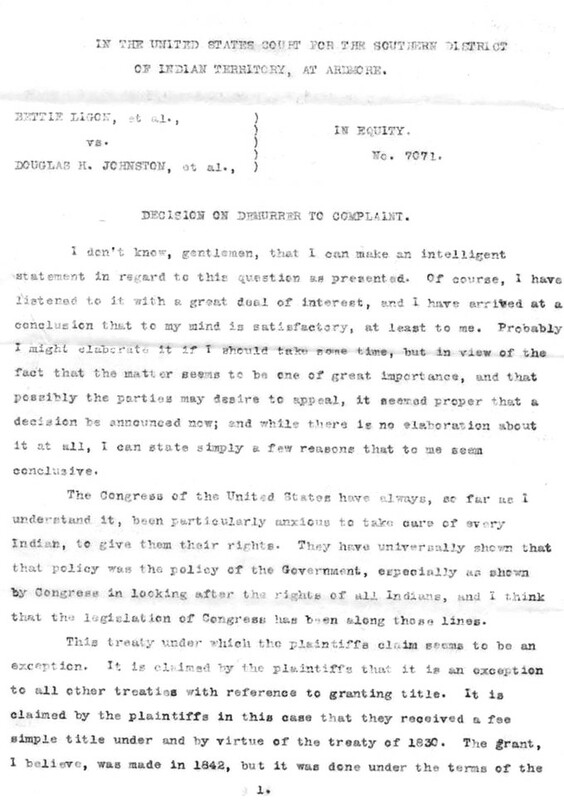 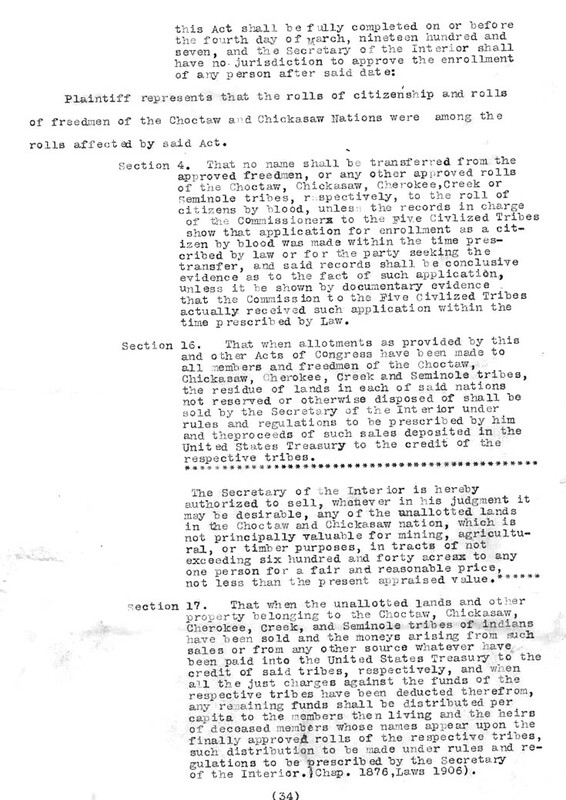 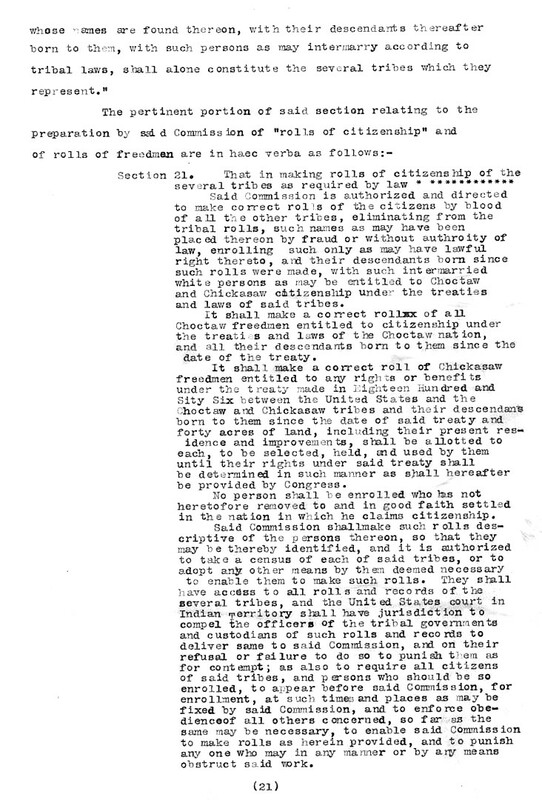 The case is part of the United States Congressional Record, 59th Congress, 2nd Session. 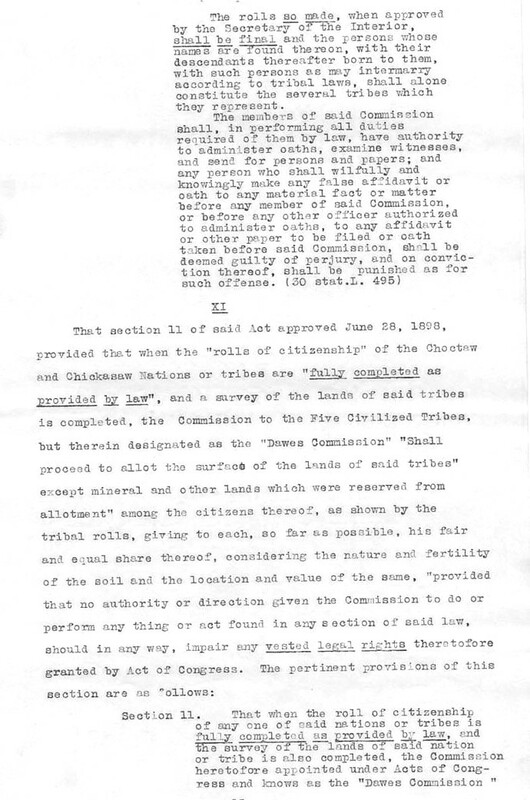 The report is called the Senate Report 5013. 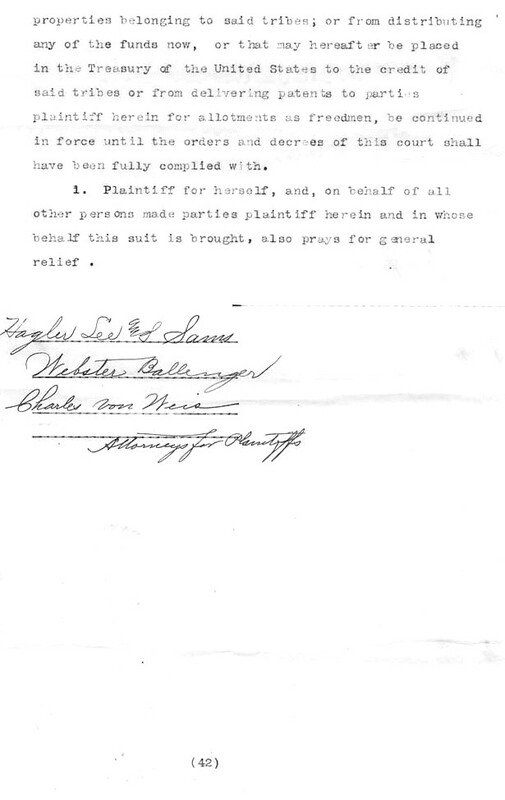 What is particularly significant about this court case is that it lists the names and roll numbers of the (living) descendants (children, grand children and great grand children) of Laney Colbert Stevenson. 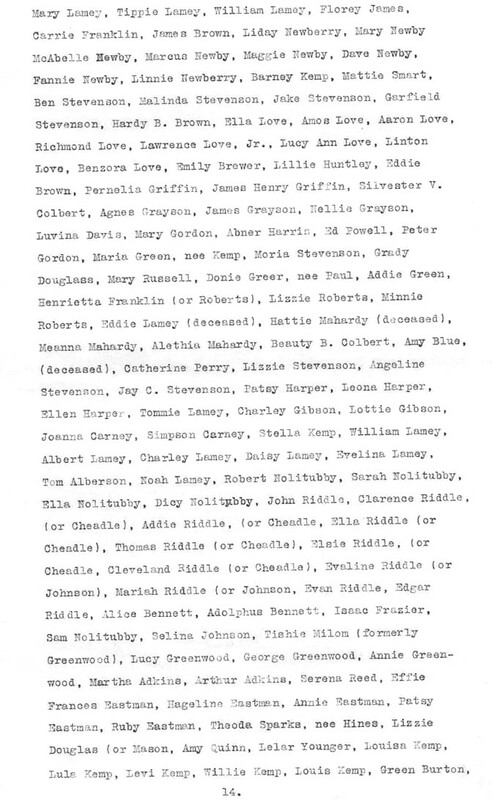 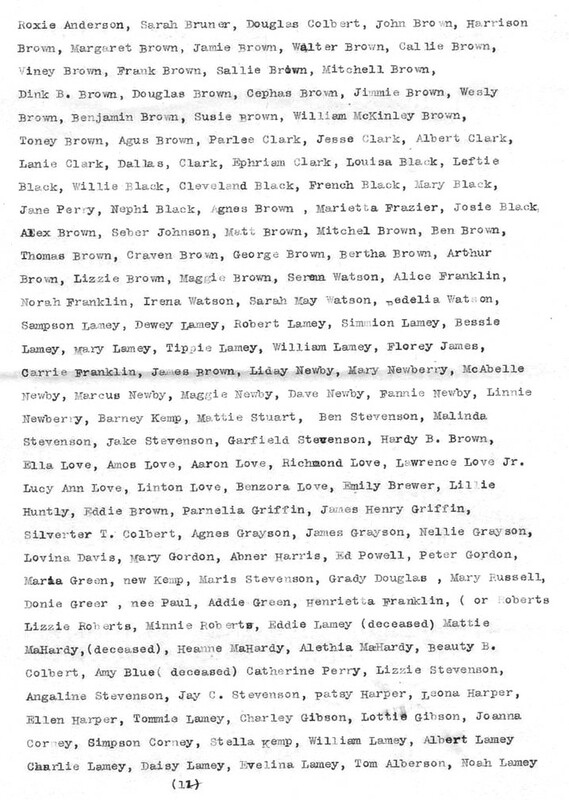 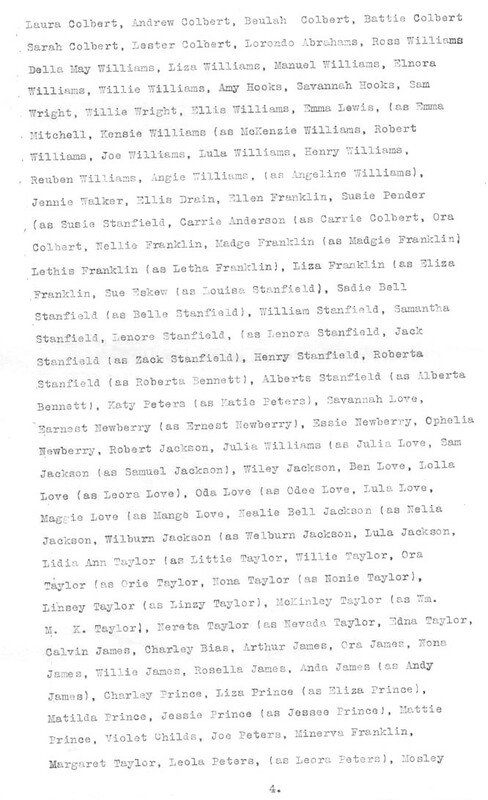 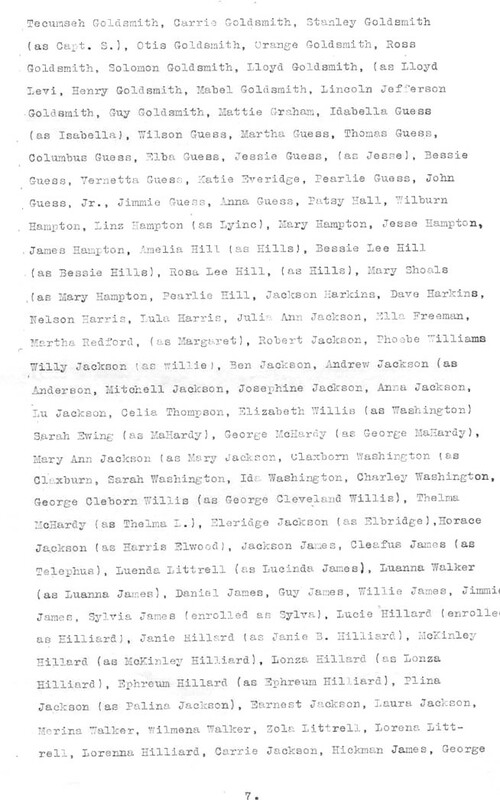 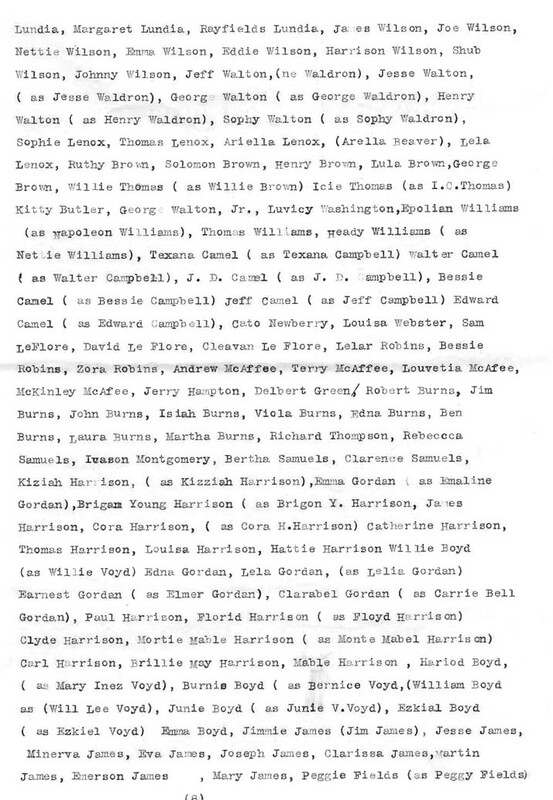 In addition to the efforts attempted by the Lanie and the descendants of Lanie to get their right as citizens, the descendants of Lanie joined with Bettie Ligon and 2000 other Freemen in a case referred to as Equity 7071. 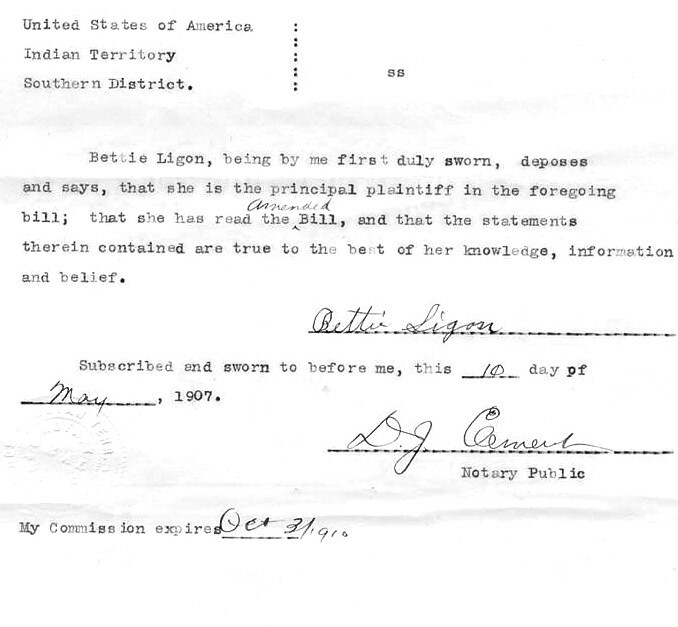 The case was filed by Bettie Ligon in 1907. 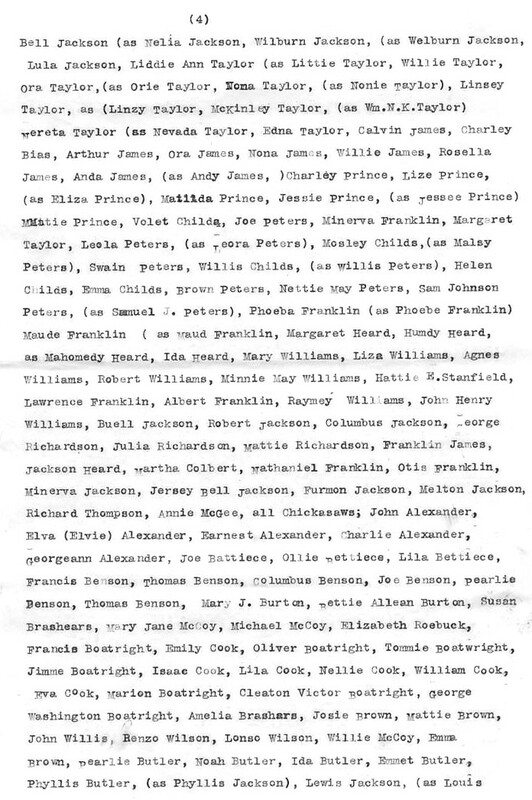 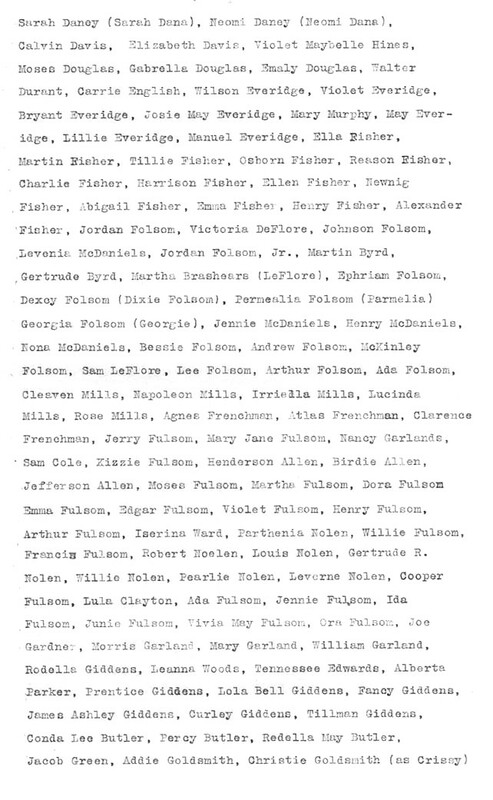 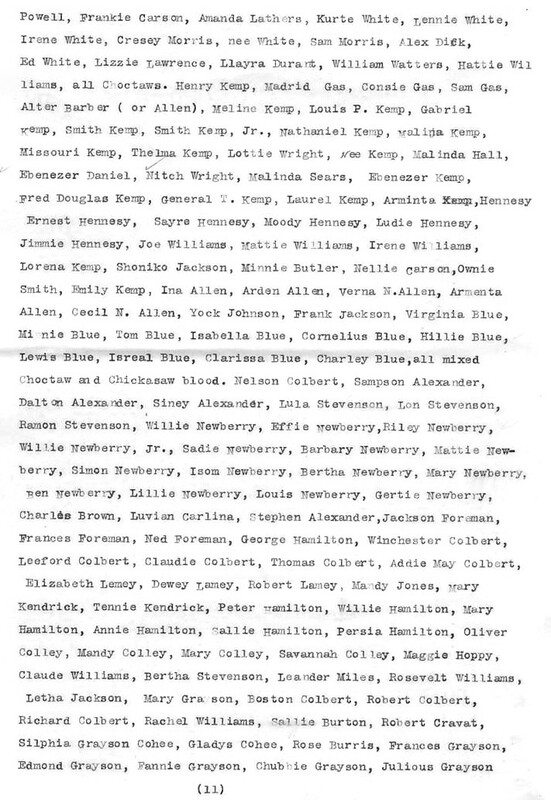 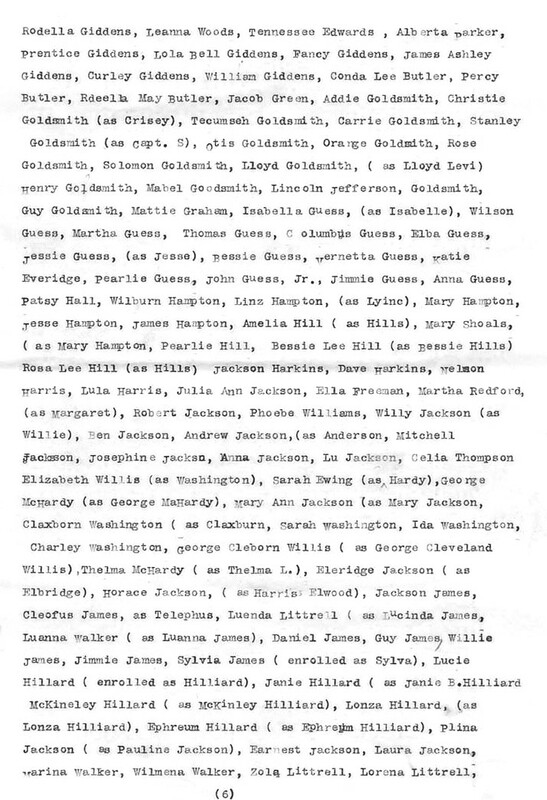 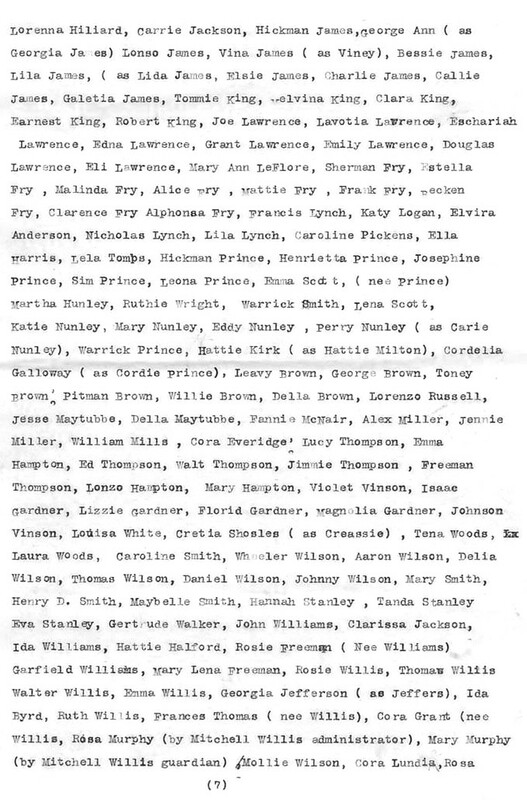 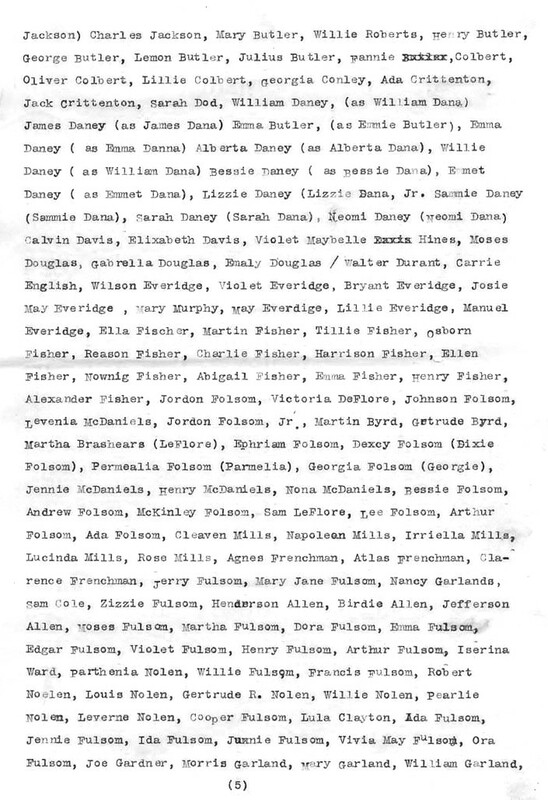 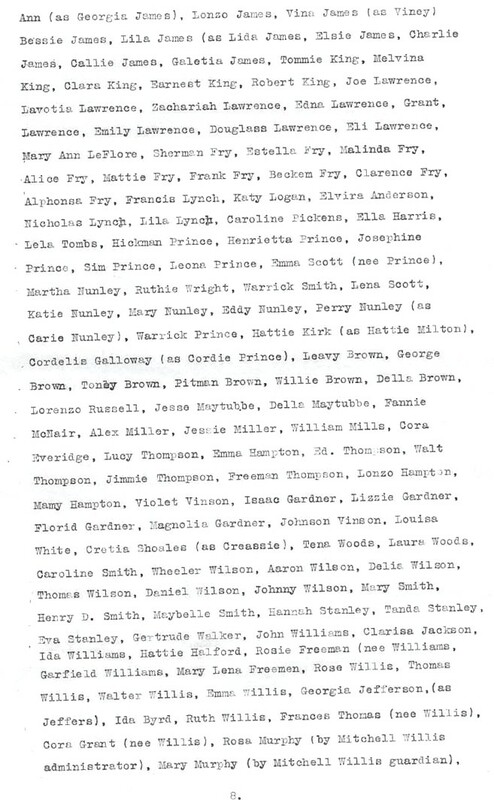 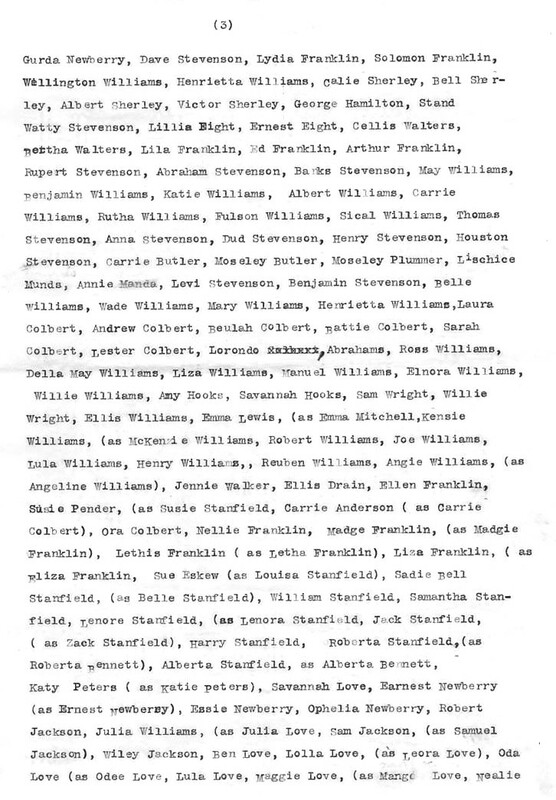 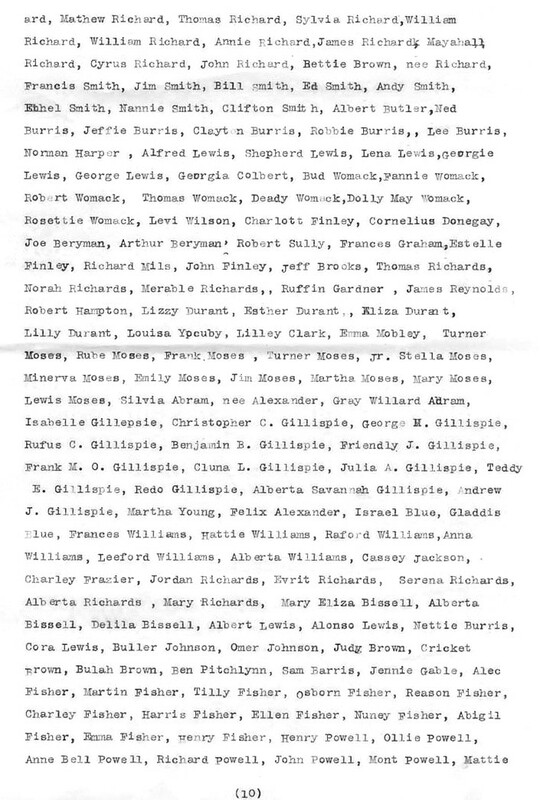 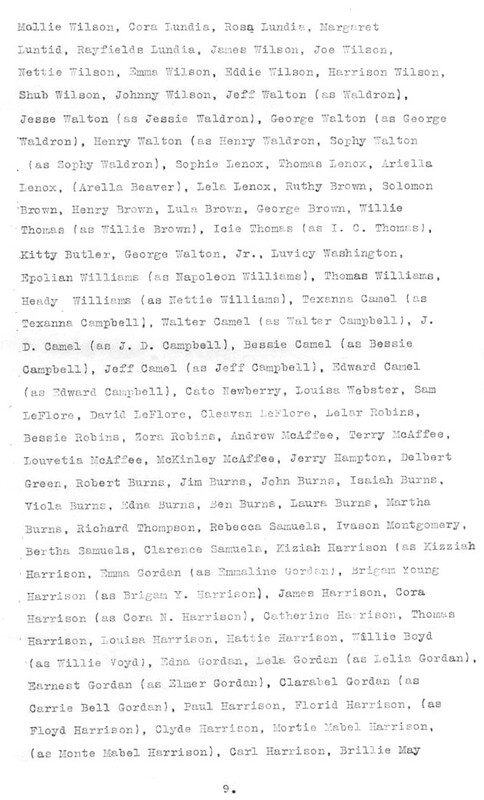 Equity 7071 contains the names of 2000 Freedmen. 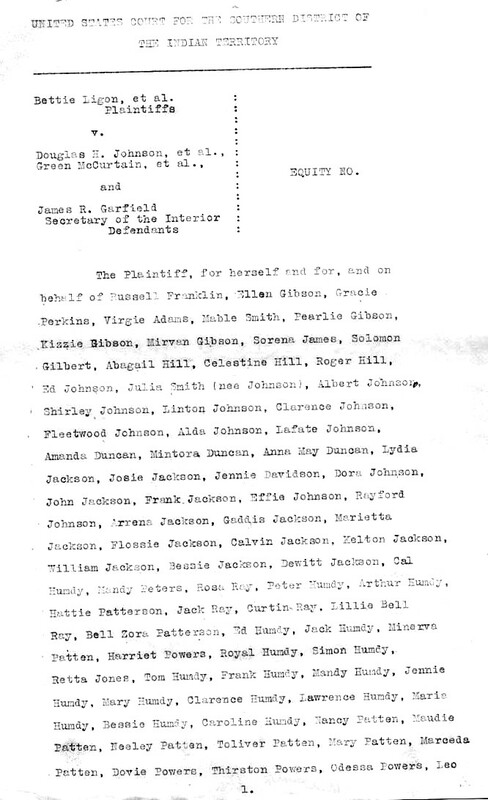 The offical name of this case is: Bettie Ligon, et.al. 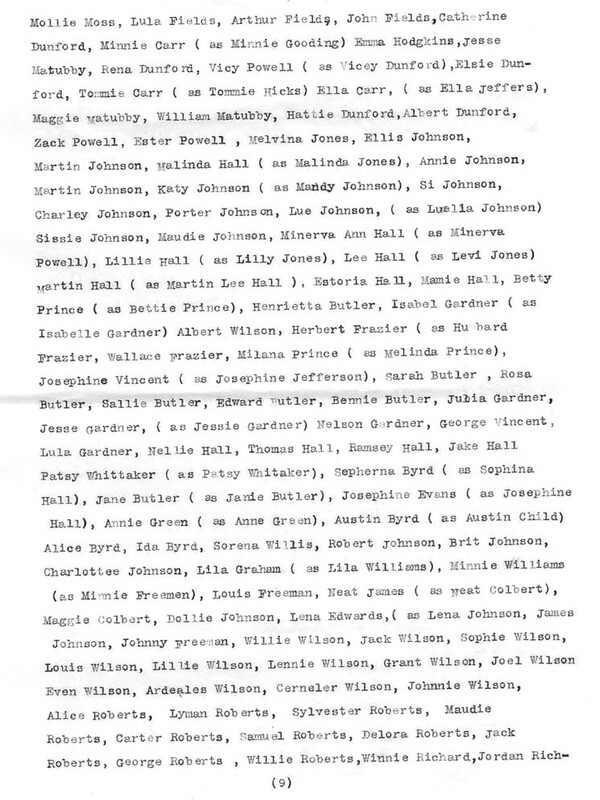 V. Douglas H. Johnson, et.al. 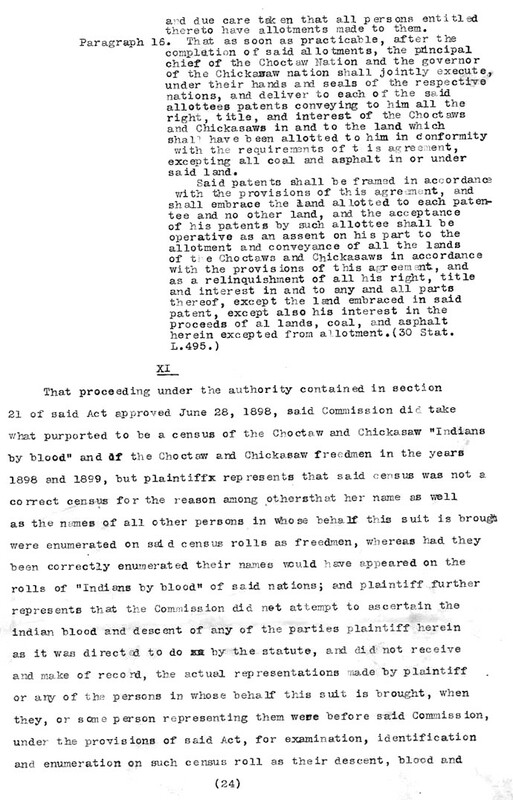 ; Green McCurtain, et.al. 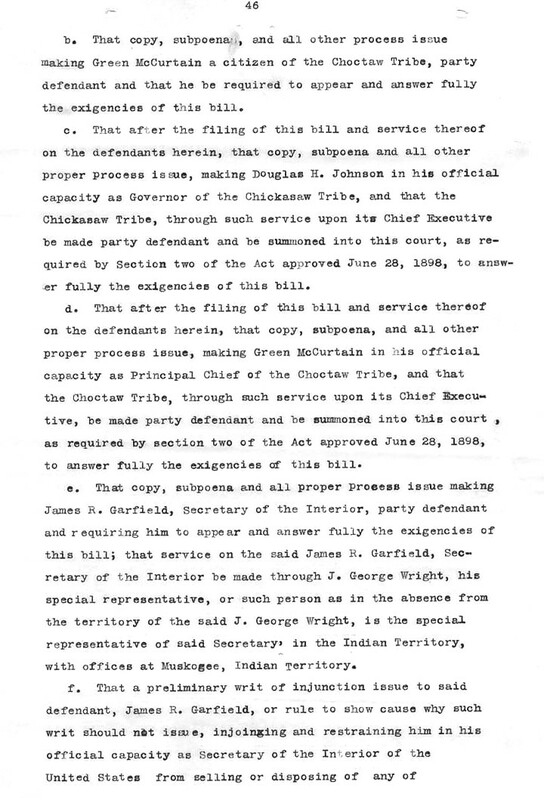 ; and James R. Garfield, secretary of the Interior. 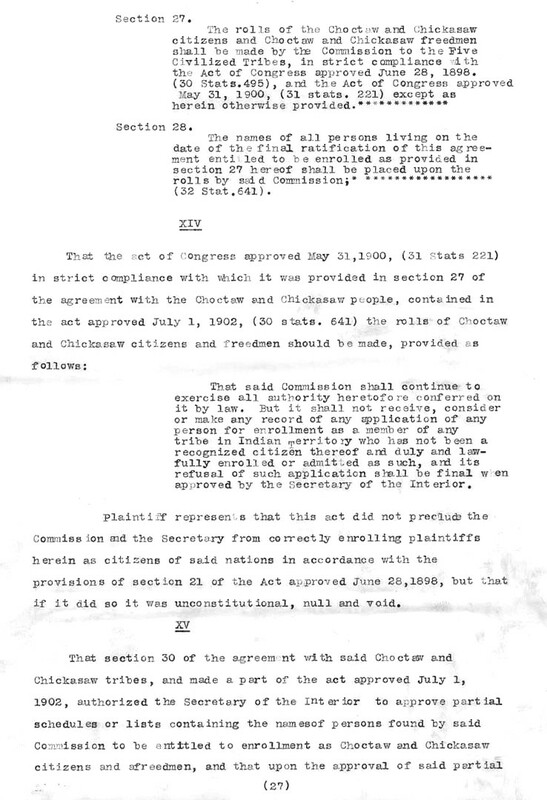 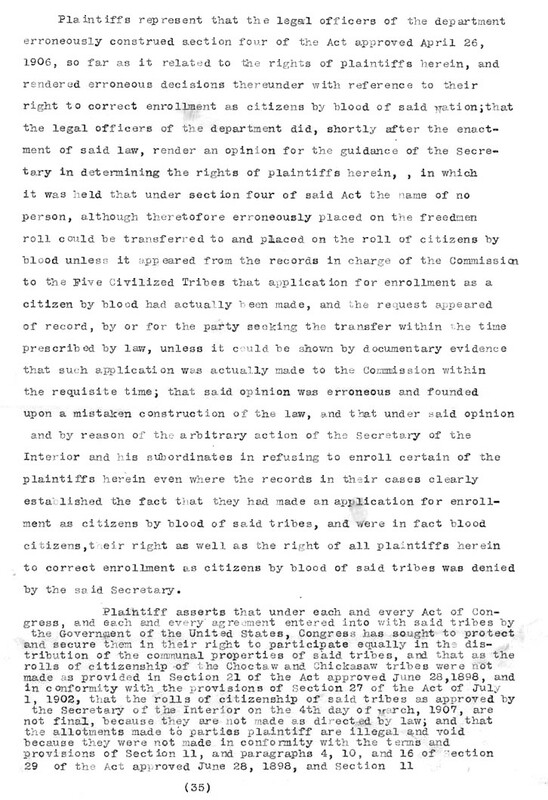 In 1911 Bettie Ligon and the 2000 Freedmen filed an amended Equity 7071 case. 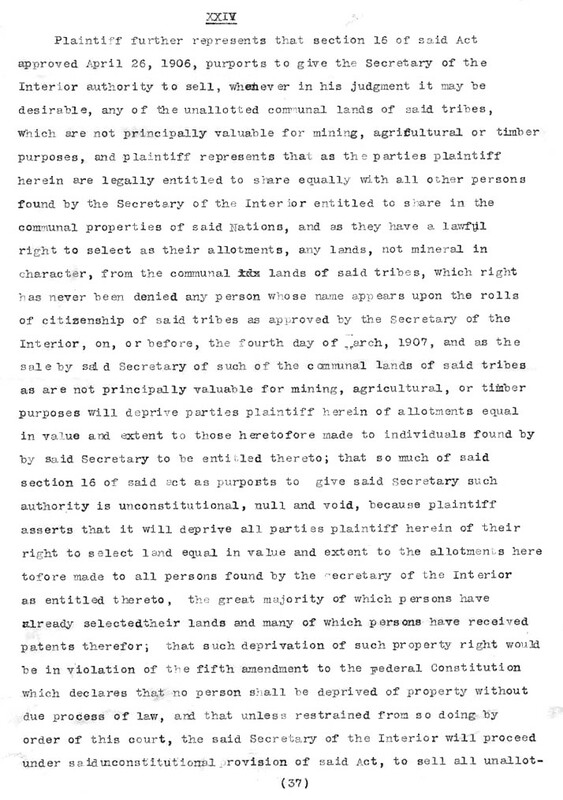 Following is the Texas Supreme Court Appellate case that was filed in 1847 to appeal the decision of the lower court. 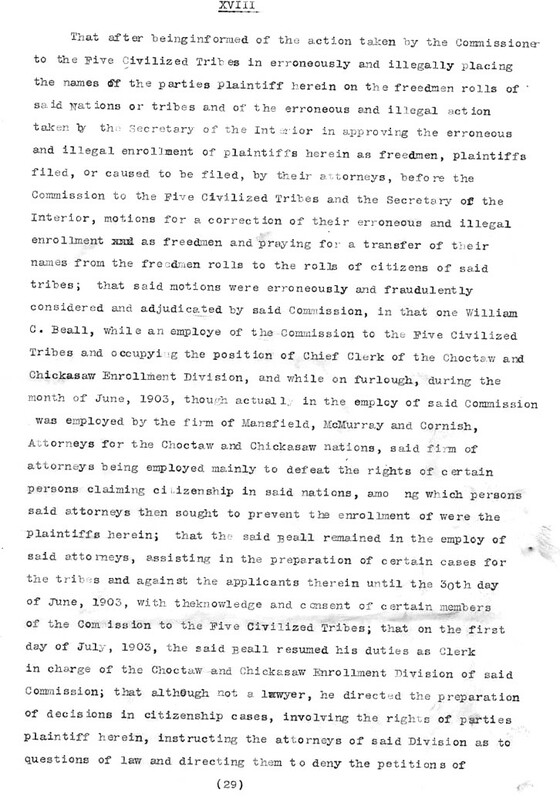 Where the plaintiffs, who were negroes, sued to establish the fact of their freedom, and gave in evidence thereof a deed of manumission in their favor, executed by their master whilst a citizen of the Chickasaw nation of Indians, and who, together with such negroes, then resided therein; and the judge charged the jury, “That in the absence of proof of any law, custom or usage of the Chickasaws forbidding the emancipation of a slave, if the deed presented was fully proven and they believed it to be good, genuine and authentic, the plaintiffs were entitled to their freedom -- Held, that such charge was correct. 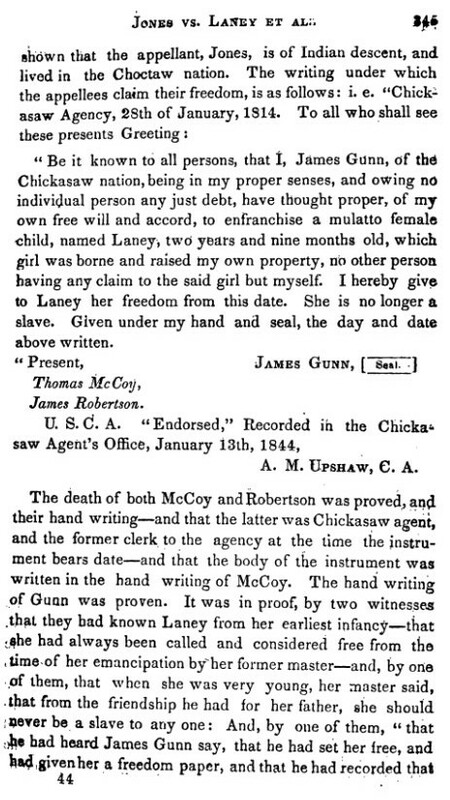 The death of both McCoy and Robertson was proved, and their handwriting, and that the latter was Chickasaw agent, and the former clerk to the agency at the time the instrument bears date, and that the body of the instrument was written in the handwriting of McCoy. 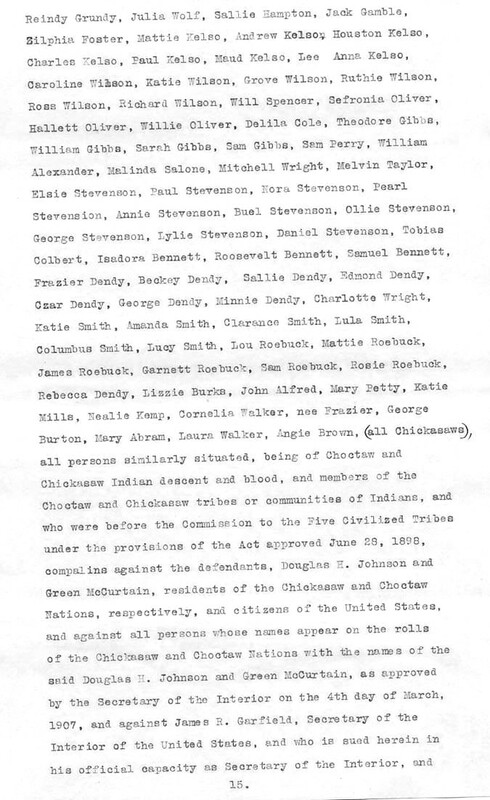 The handwriting of Gunn was proven. 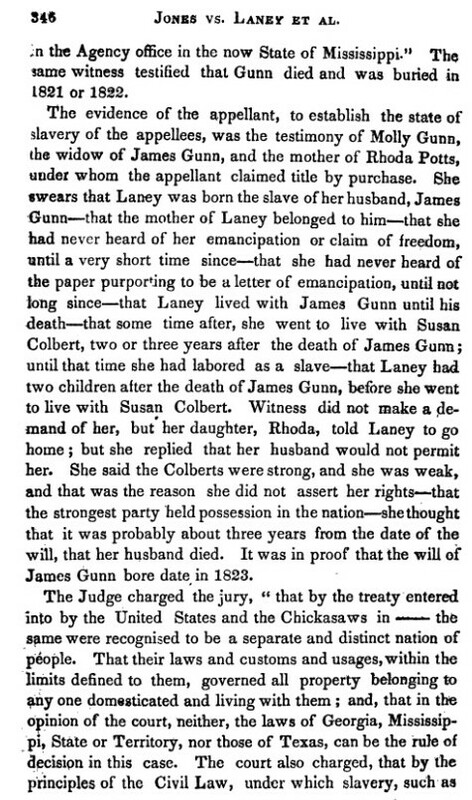 It was in proof, by two witnesses that they had known Laney from her earliest infancy -- that she had always been called and considered free from the time of her emancipation by her former master -- and, by one of them, that when she was very young, her master said that from the friendship he had for her father, she should never be a slave to any one: And, by one of them, “that he had heard James Gunn say that he had set her free and had given her a freedom paper, and that he had recorded that in the Agency office in the now state of Mississippi.” The same witness testified that Gunn died and was buried in 1821 or 1822. 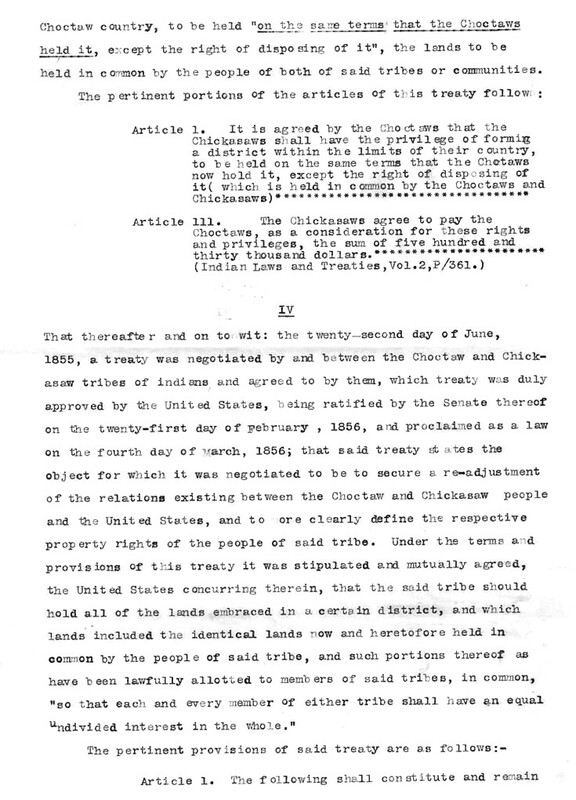 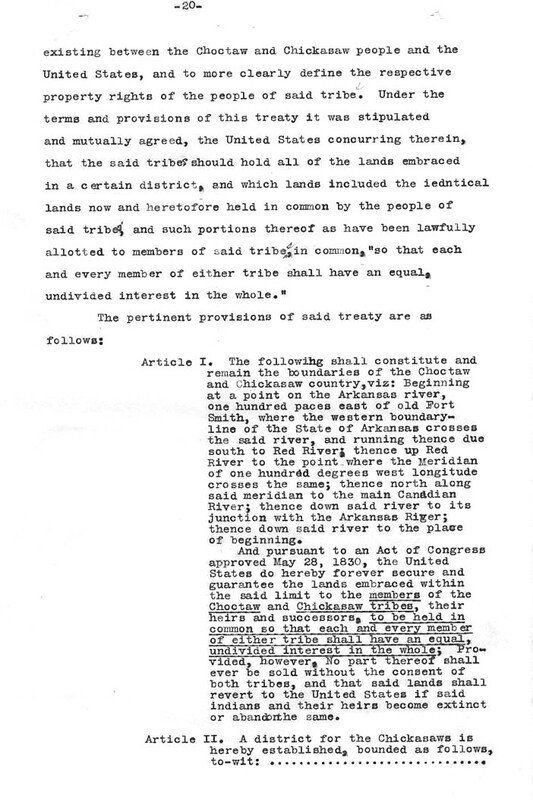 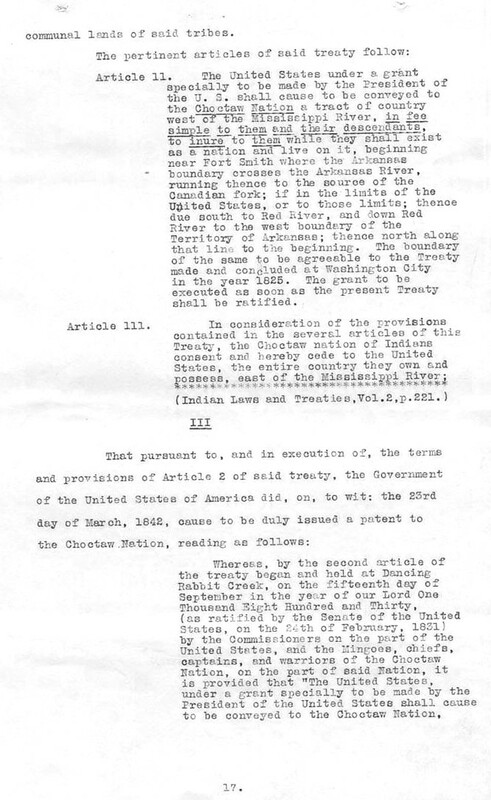 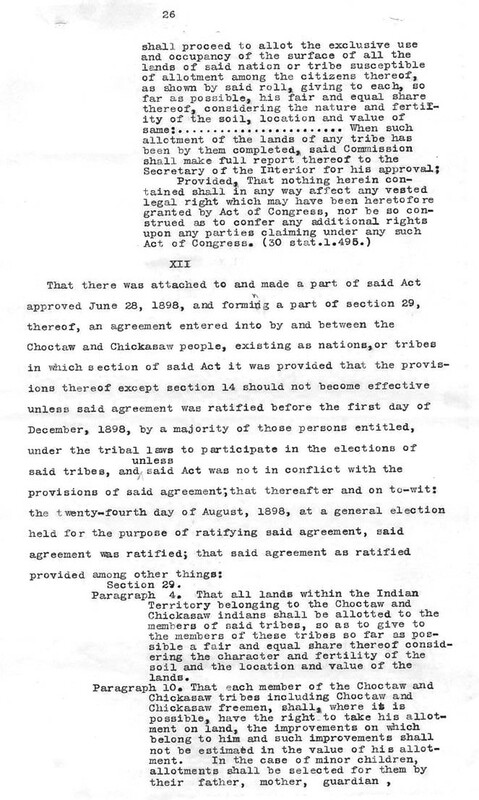 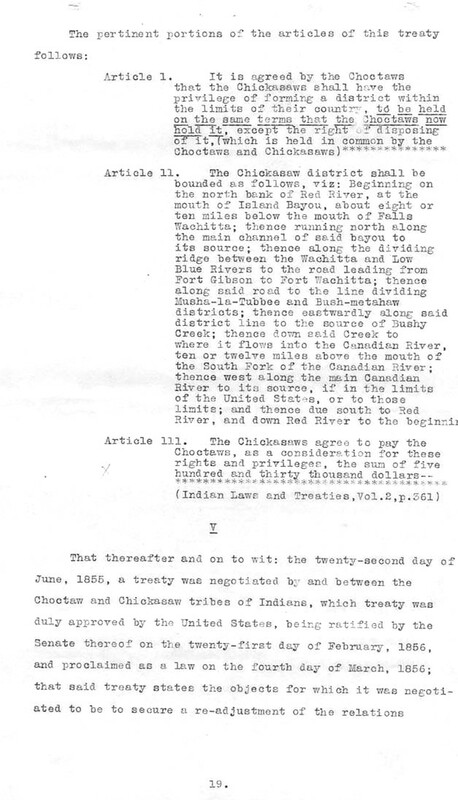 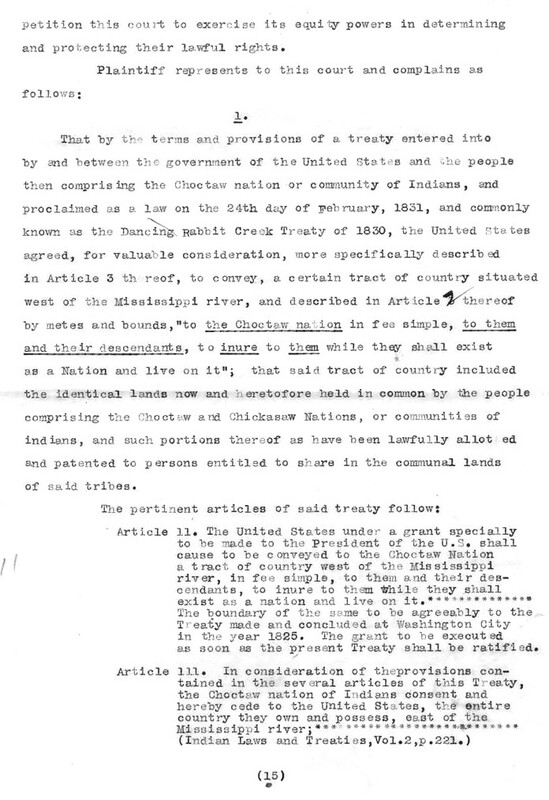 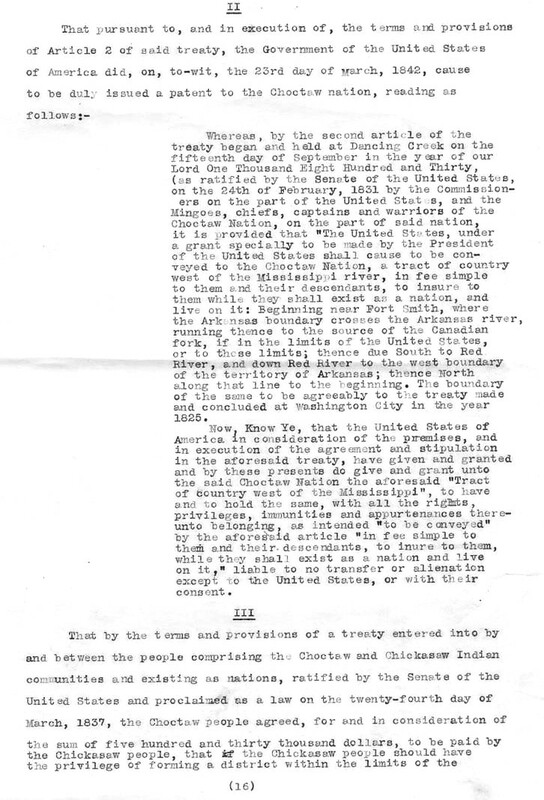 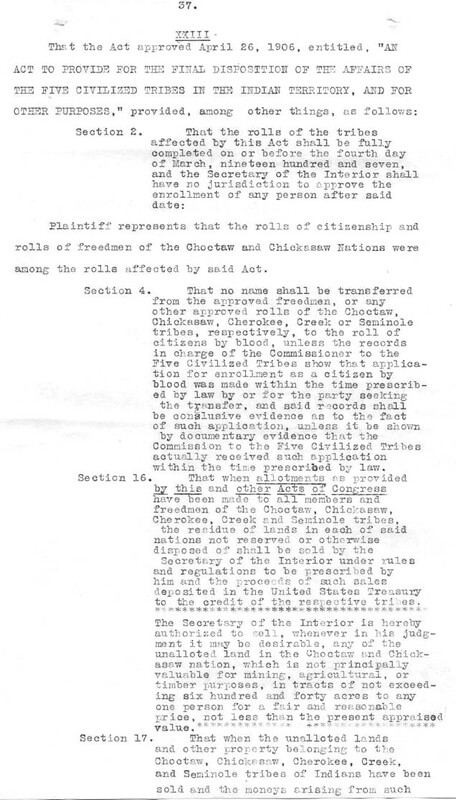 The Judge charged the jury “that by the treaty entered into by the United States and the Chickasaws in ____, the same were recognized to be a separate and distinct nation of people. 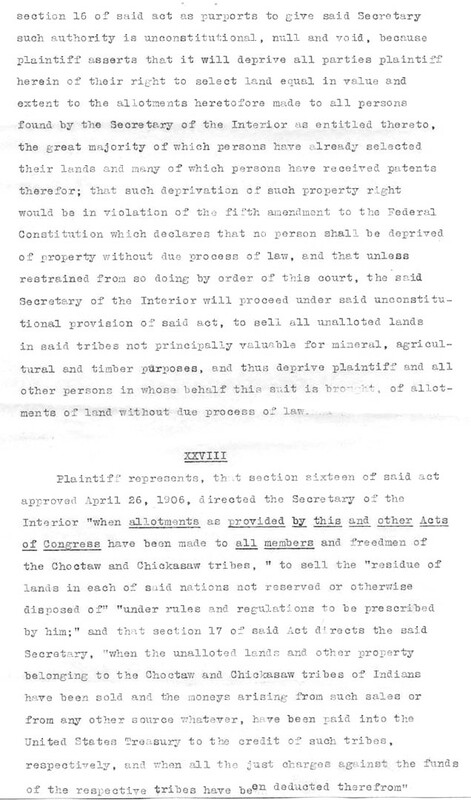 That their laws and customs and usages, within the limits defined to them, governed all property belonging to any one domesticated and living with them: and that in the opinion of the court, neither the laws of Georgia, Mississippi, State or Territory, nor those of Texas, can be the rule of decision in this case. 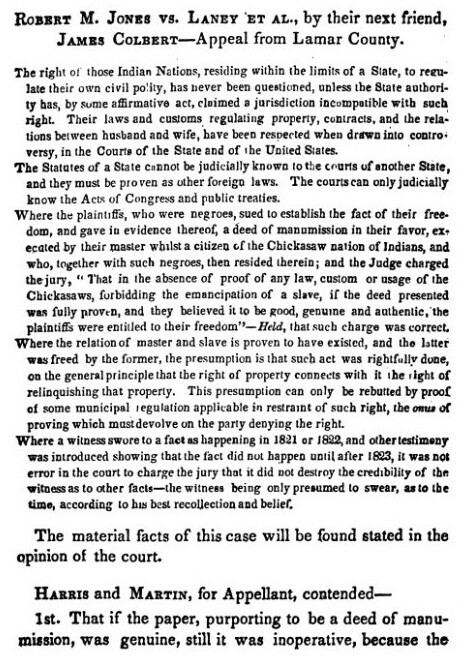 The court also charged, that by the principles of the Civil Law, under which slavery, such as ours, existed, the owner could free his slave, provided no statute prohibiting such manumission existed, by simply discharging him from service and saying “go, you are free.”, This doctrine has been partially recognized in various States of the Union, by ruling that in the absence of Statutes prohibiting manumission, only the fact which amounts to proof of an actual discharge from service, with an expressed determination, either parol or written, of no intention to revoke such discharge, will amount to emancipation. 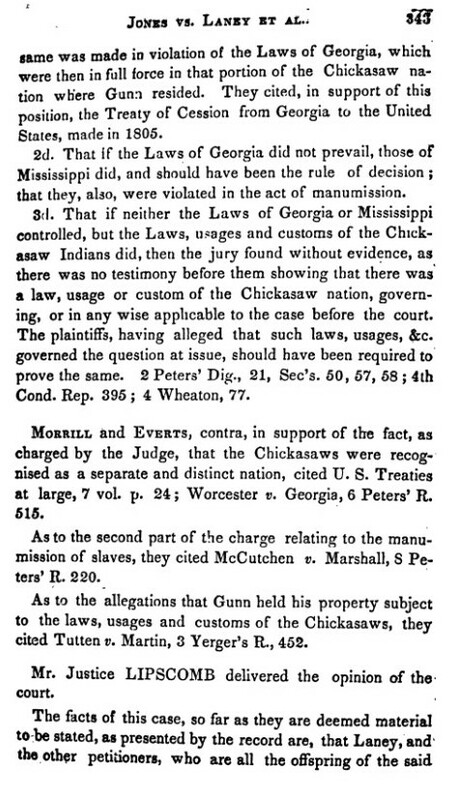 Taking these principles as our guide, in the absence of proof of any law, custom or usage of the Chickasaws, forbidding the emancipation of a slave, if the deed presented be fully proved, and by the jury believed to be good, genuine and authentic, the plaintiffs are entitled to their freedom. 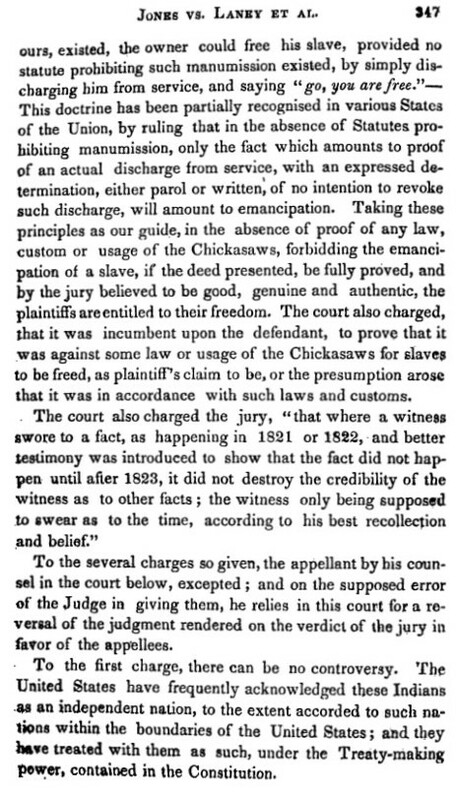 The court also charged that it was incumbent upon the defendant, to prove that it was against some law or usage of the Chickasaws for slaves to be freed, as plaintiffs claim to be, or the presumption arose that it was in accordance with such laws and customs. 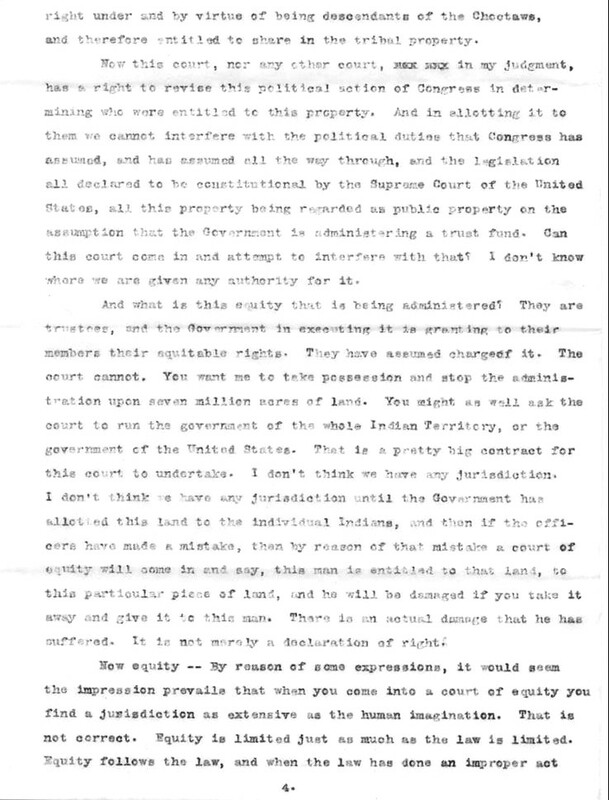 The Supreme Court of the United States, say that “as a general proposition, it would seem a little extraordinary to contend that the owner of property is not at liberty to renounce his right to it, either absolutely, or in any modified manner he may think proper. 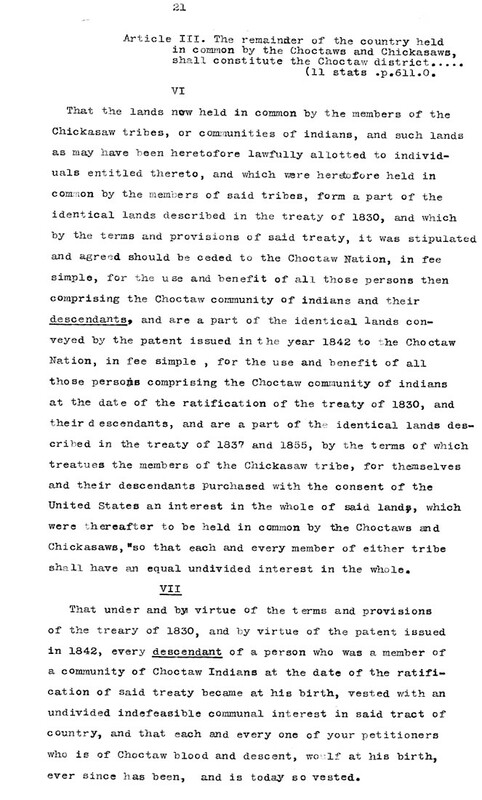 As between the owner and his slave, it would require the most explicit prohibition by law to restrain this right,” 8 Peters, 220. 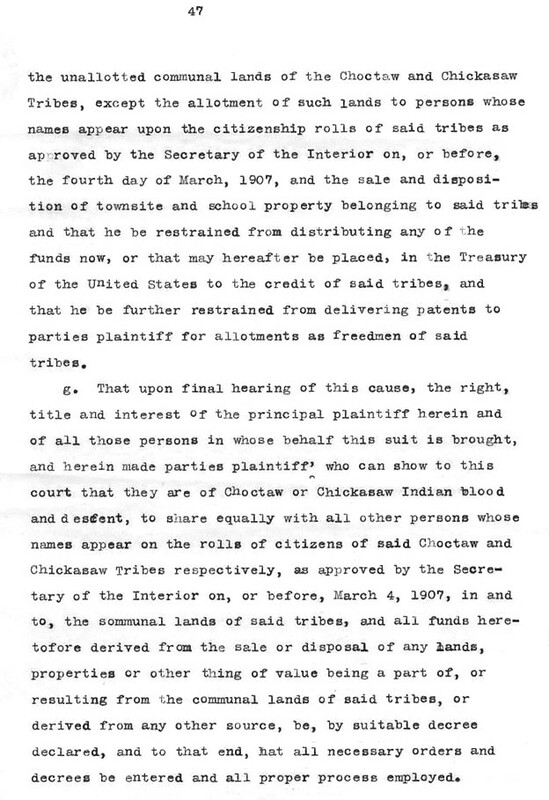 The 4th charge is embraced in the decision on the preceding one. 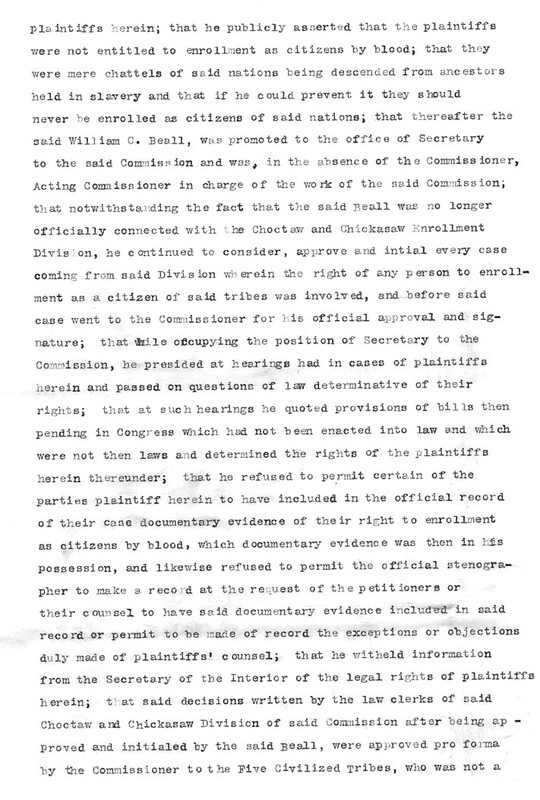 The last charge is on the effect, or the credibility of a witness, when he swears to a fact happening at a particular date, and better testimony was given showing that it was not true. 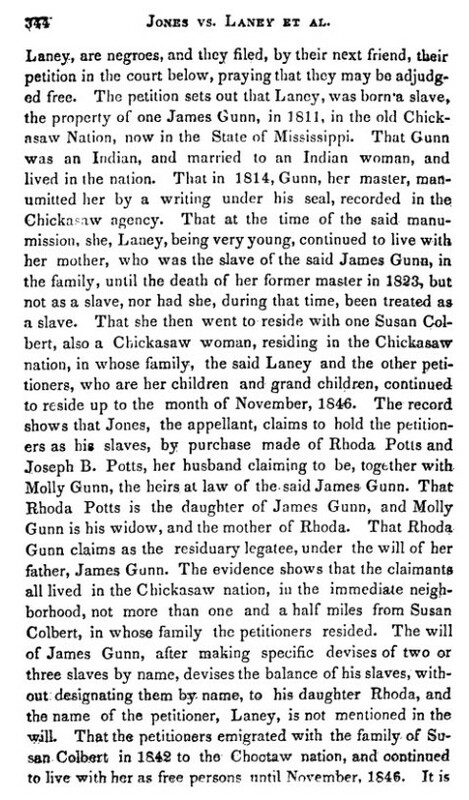 One of the witnesses swore that Gunn died in 1821 or 1822. 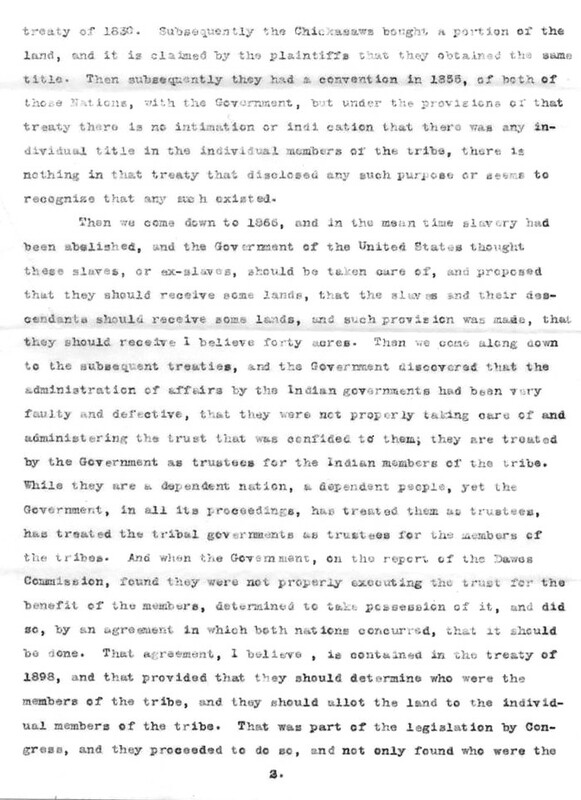 It was shown by the Will of Gunn, that it was after 1823. 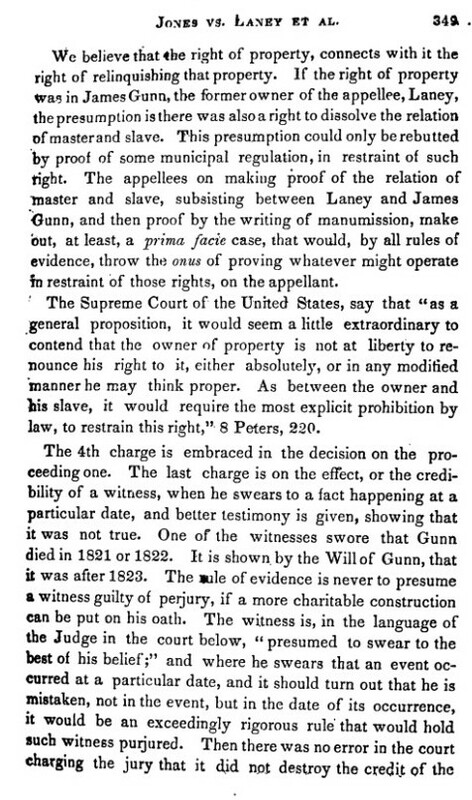 The rule of evidence is never to presume a witness guilty of perjury, if a more charitable construction can be put on his oath. 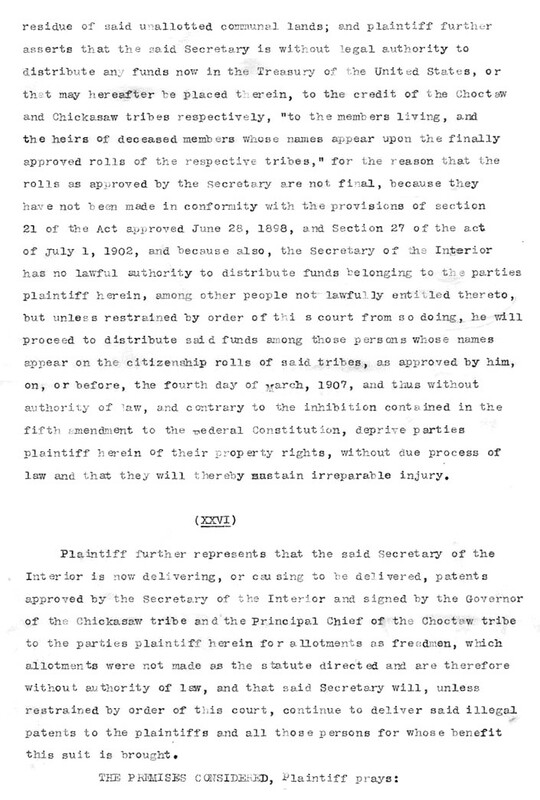 The witness is, in the language of the Judge in the court below, “presumed to swear to the best of his belief;” and where he swears that an event occurred at a particular date, and it should turn out that he is mistaken, not in the event but in the date of its occurrence, it would be an exceedingly rigorous rule that would hold such witness perjured. 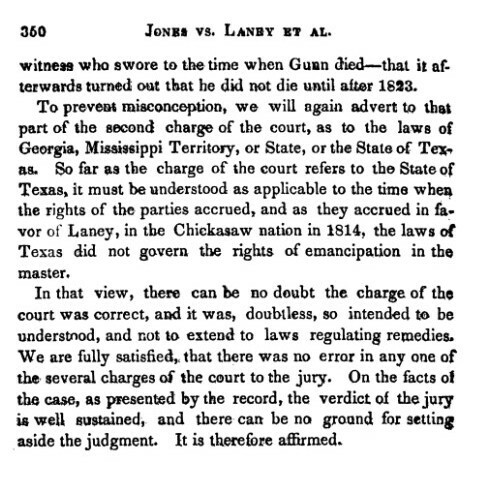 Then there was no error in the court charging the jury that it did not destroy the credit of the witness who swore to the time when Gunn died -- that it afterwards turned out that he did not die until after 1823. 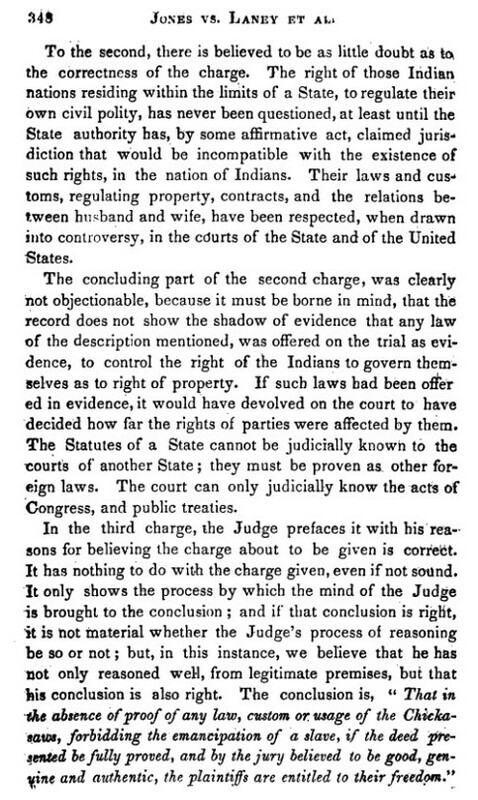 In that view, there can be no doubt the charge of the court was correct, and it was doubtless so intended to be understood, and not to extend to laws regulating remedies. 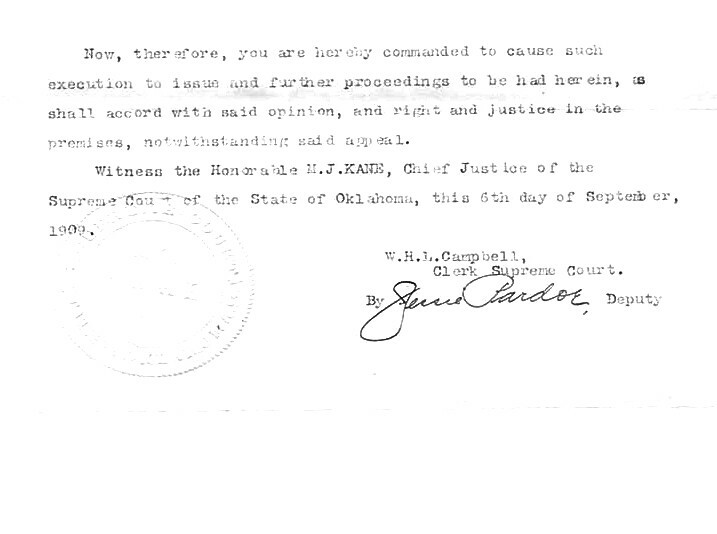 We are fully satisfied, that there was no error in any one of the several charges of the court to the jury. 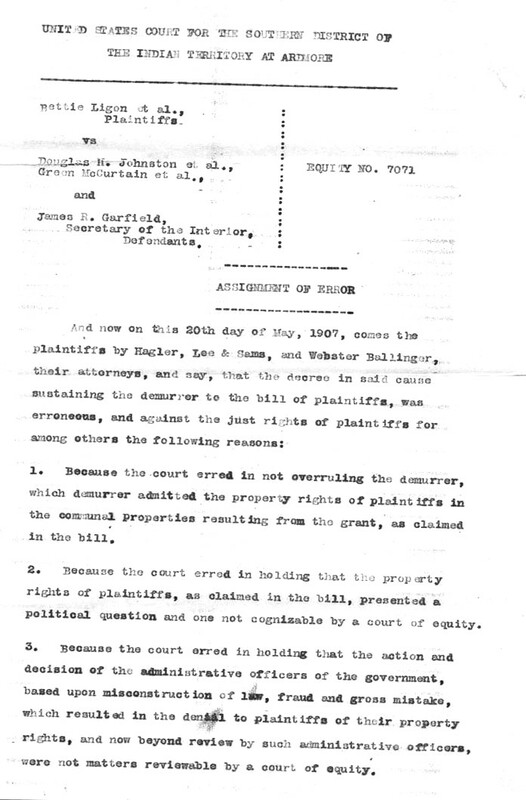 On the facts of the case, as presented by the record, the verdict of the jury is well sustained, and there can be no ground for setting aside the judgment. 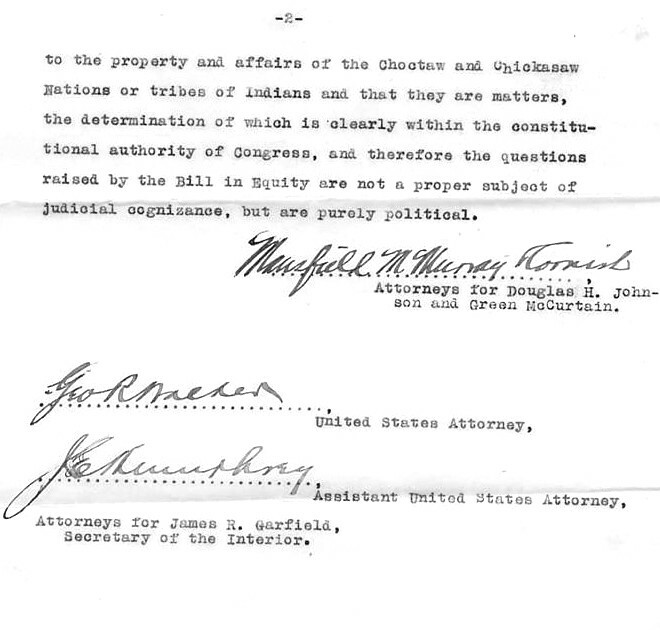 It is therefore affirmed. 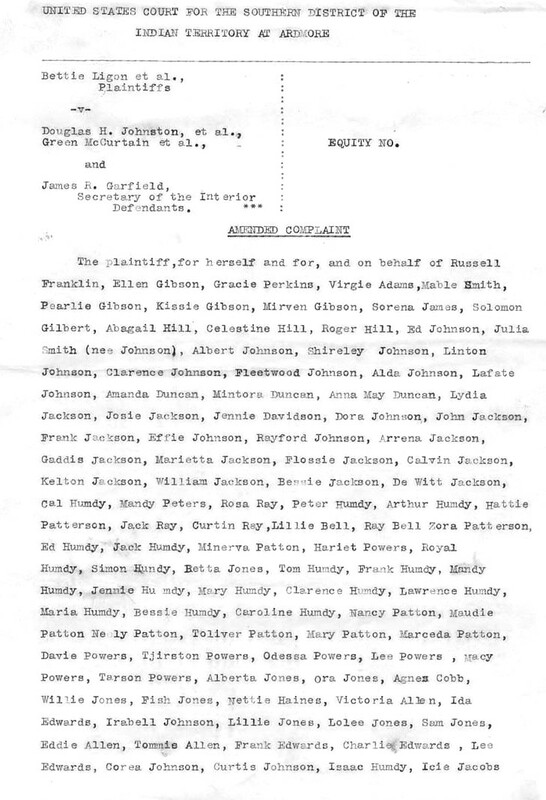 This case was filed by Bettie Ligon on behalf of 2000 other Freedmen who were seeking to be recognized as citizens. 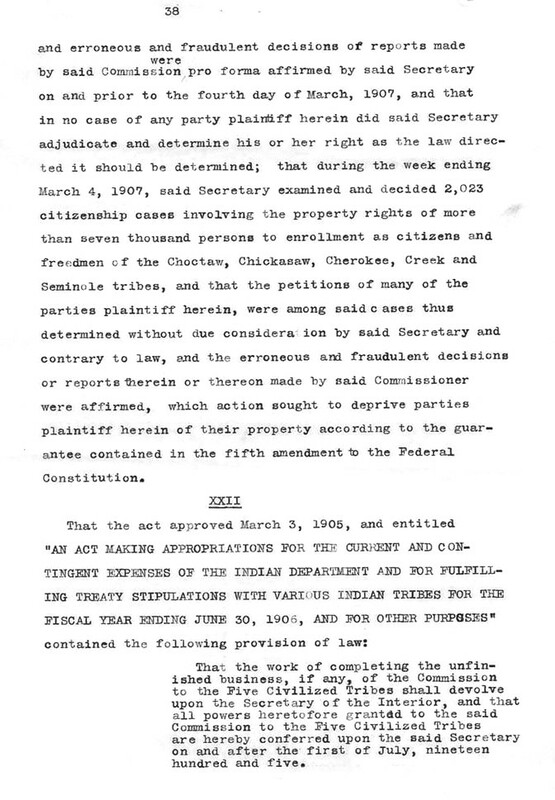 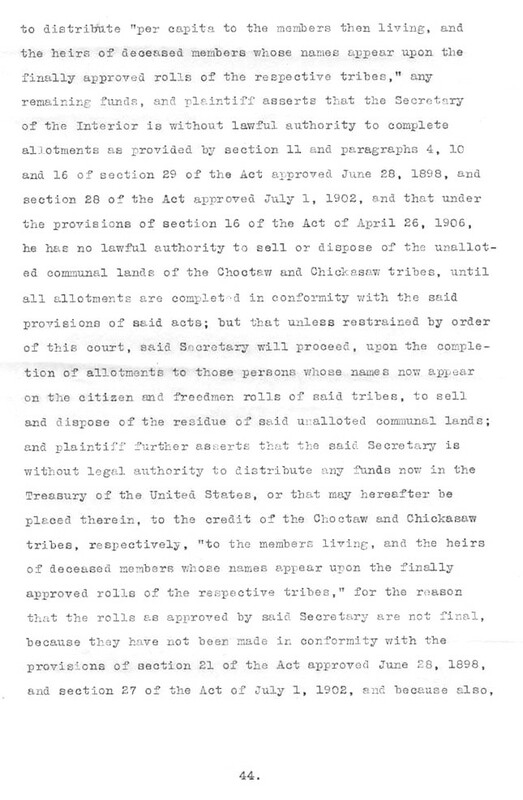 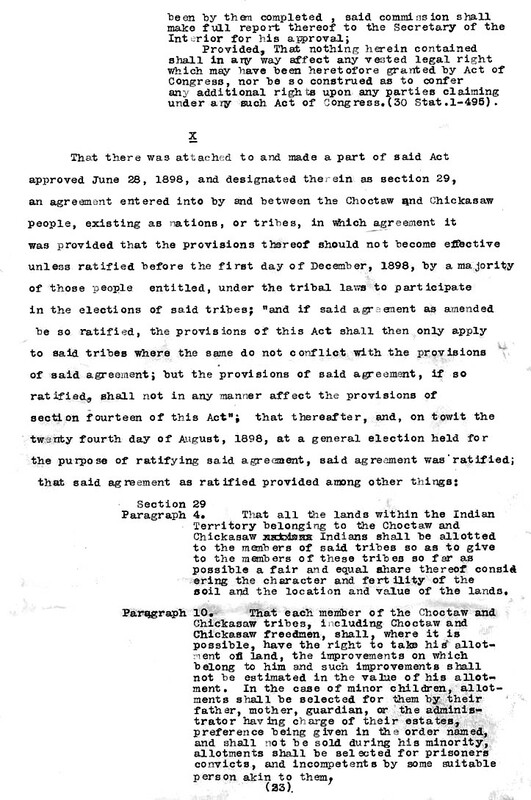 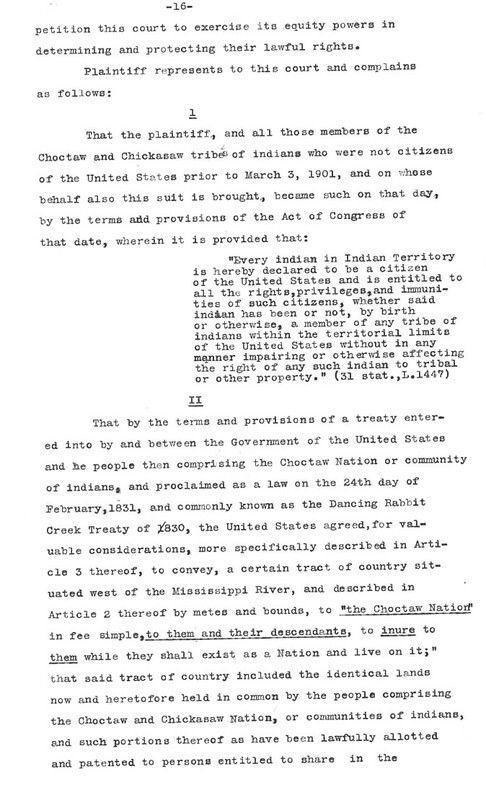 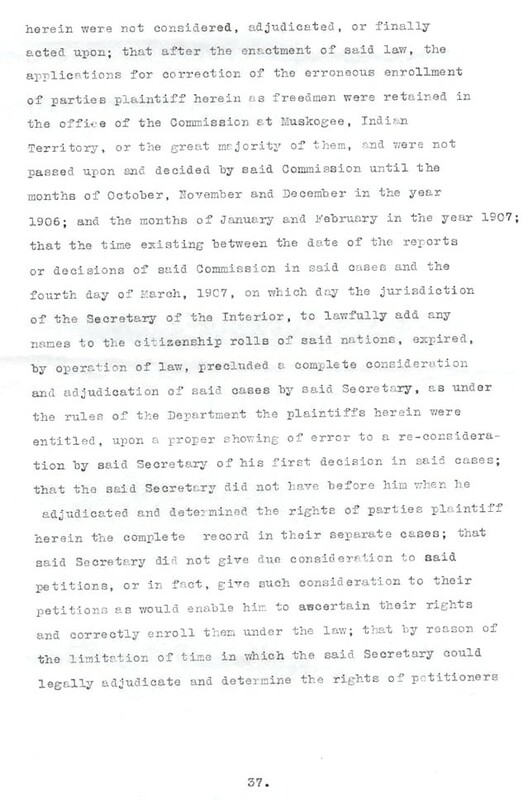 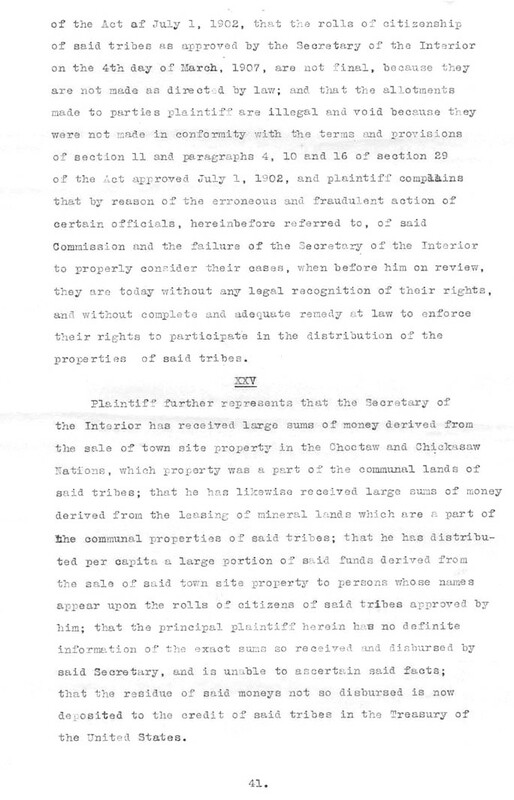 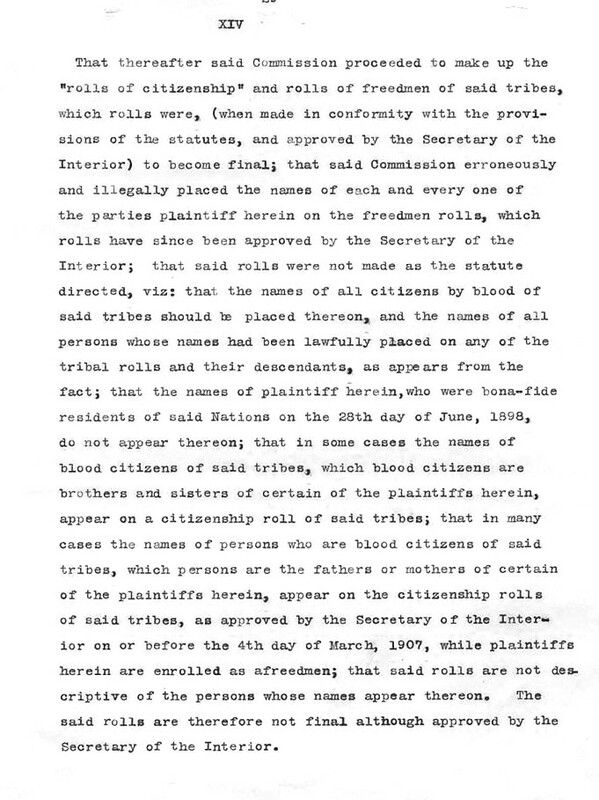 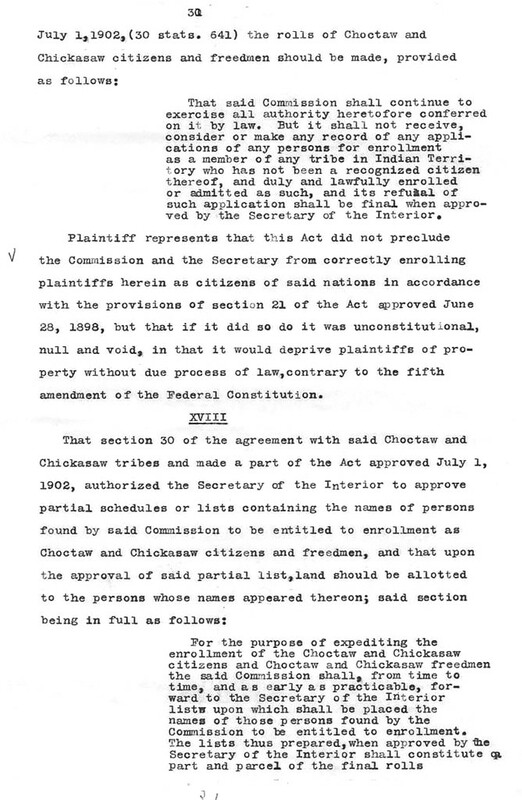 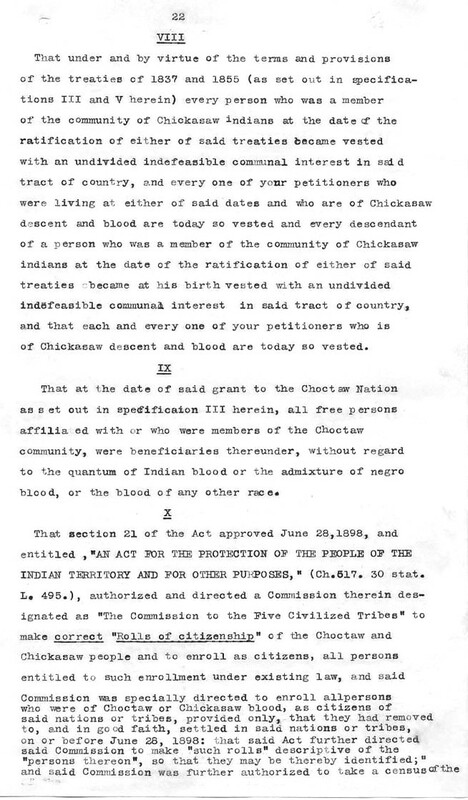 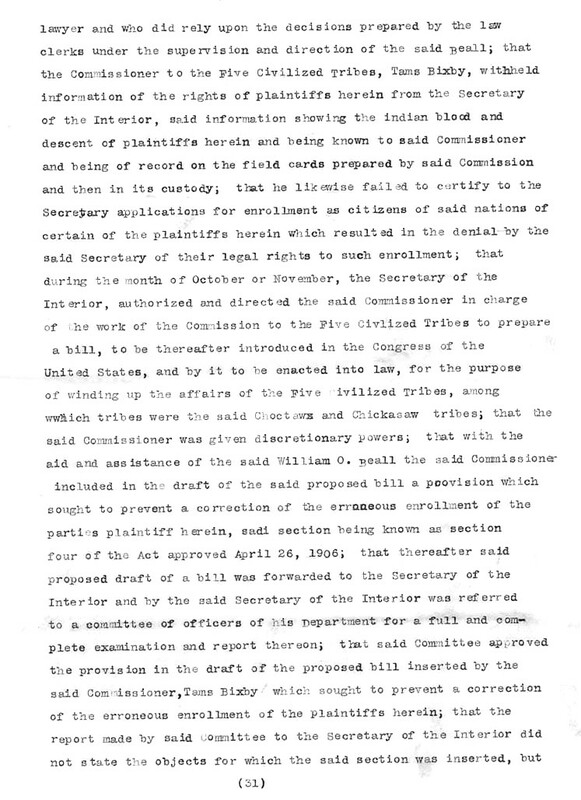 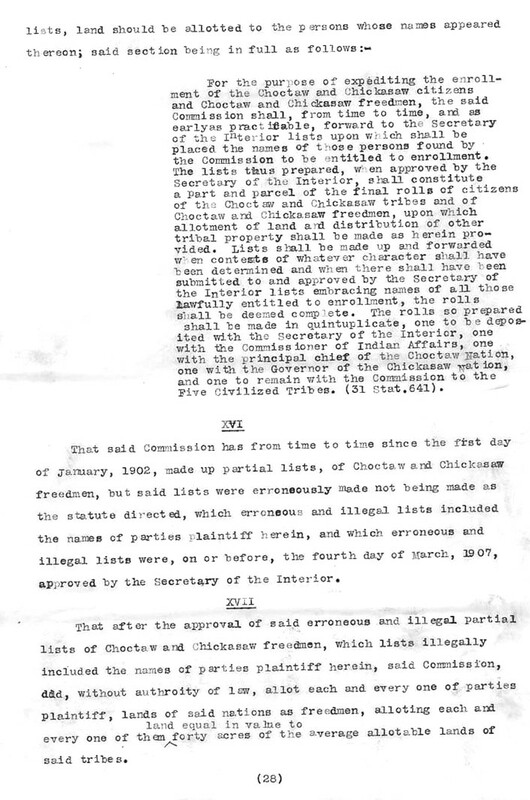 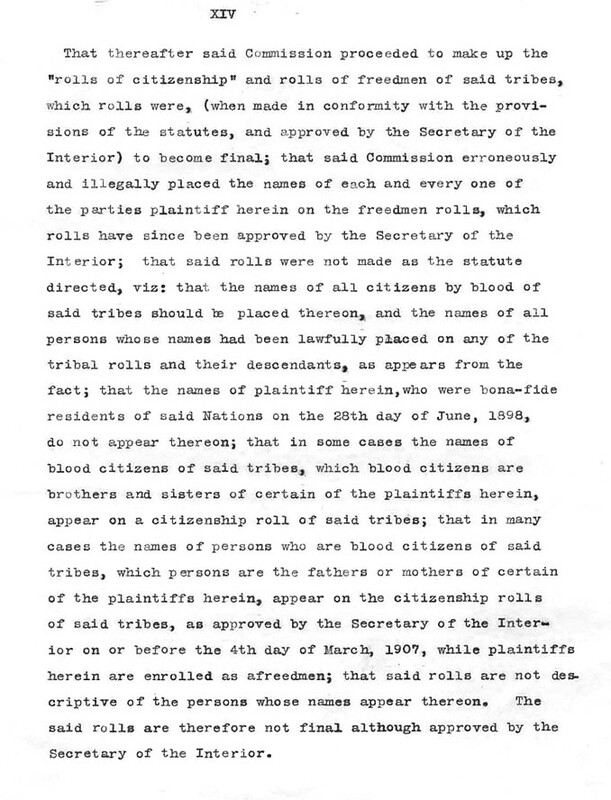 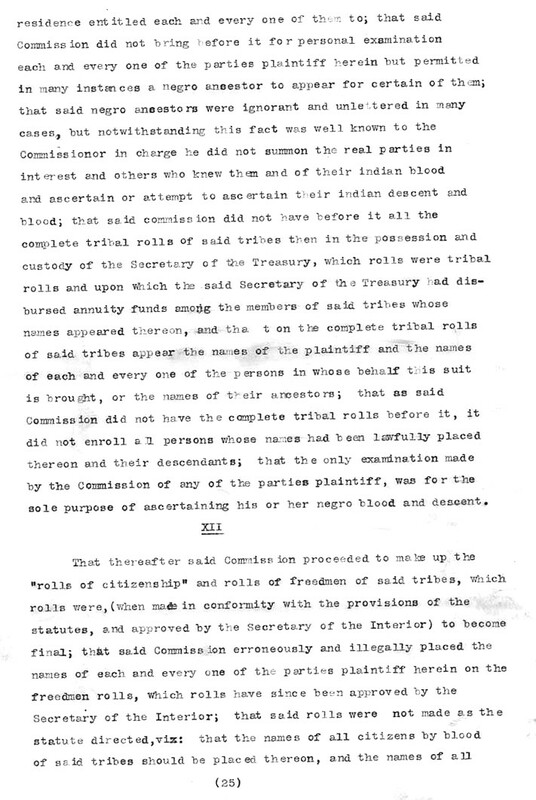 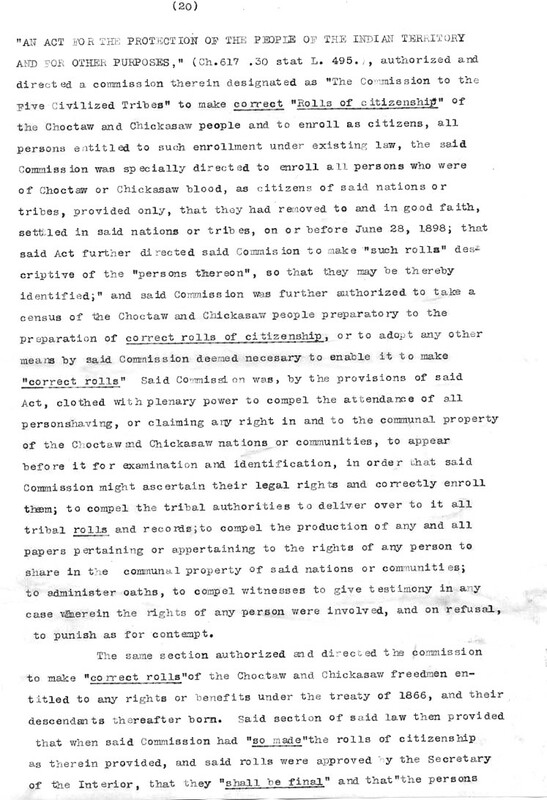 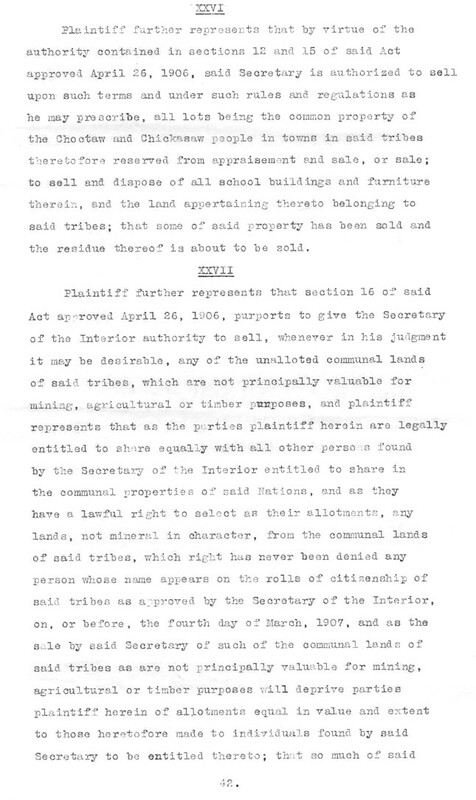 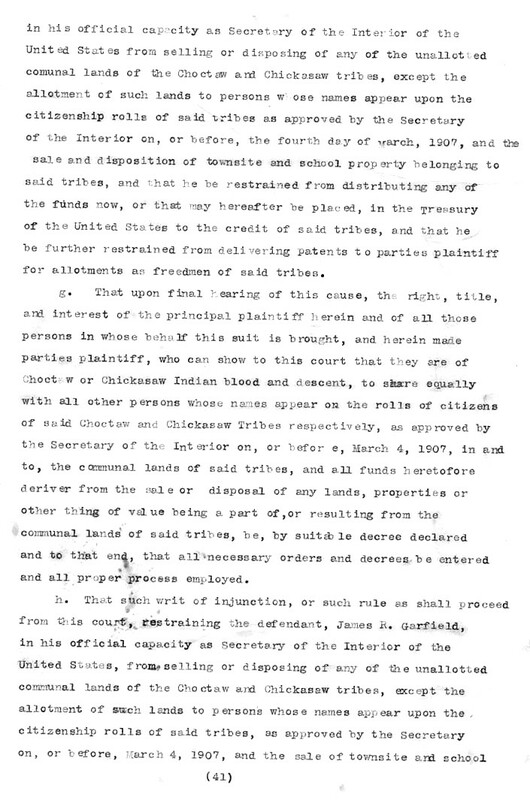 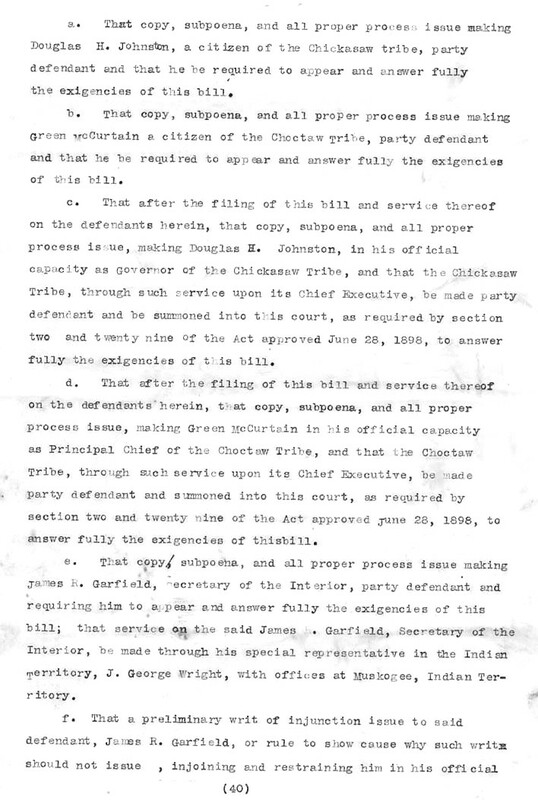 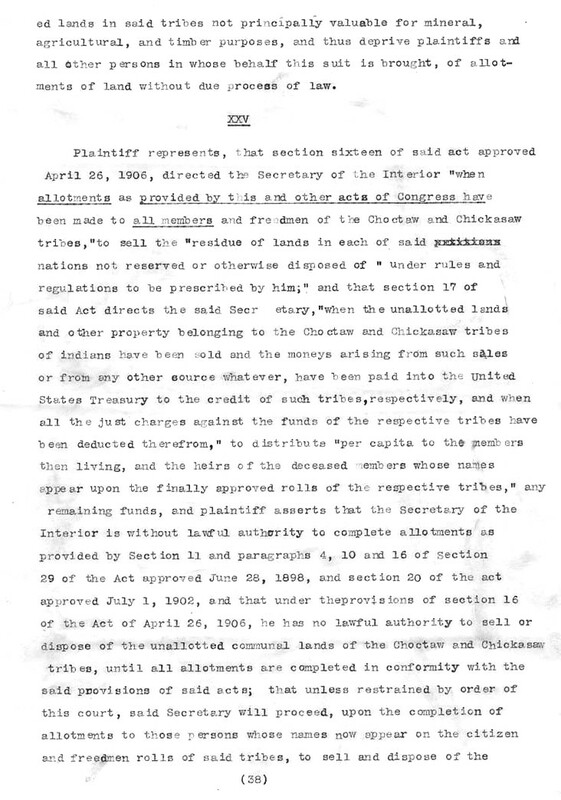 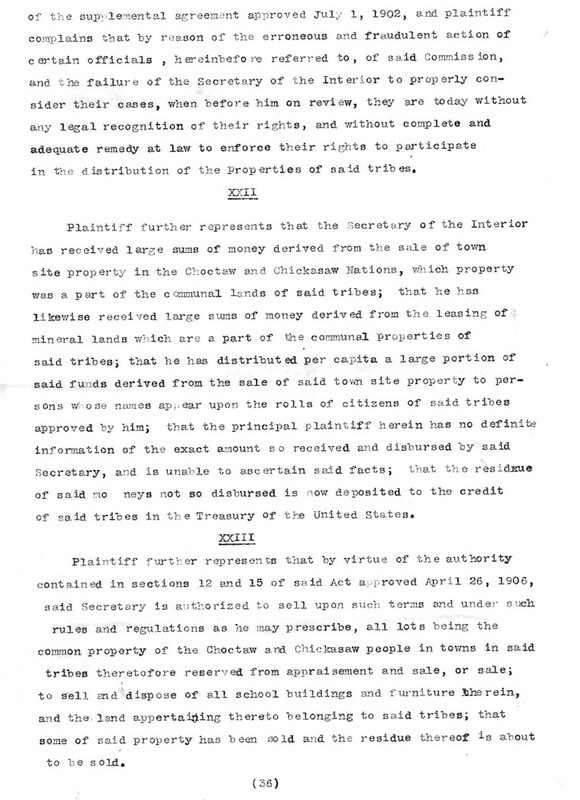 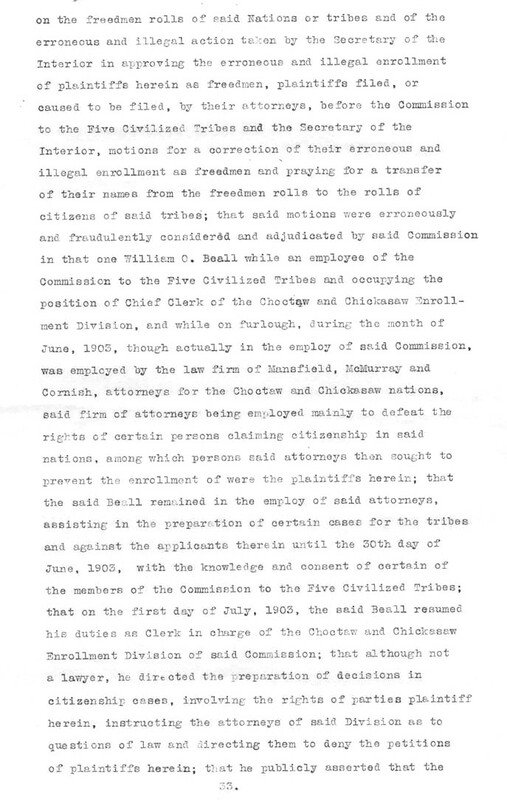 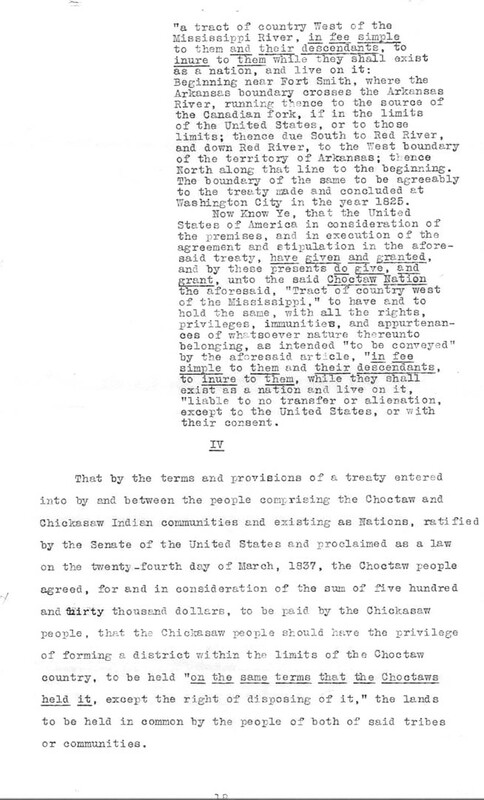 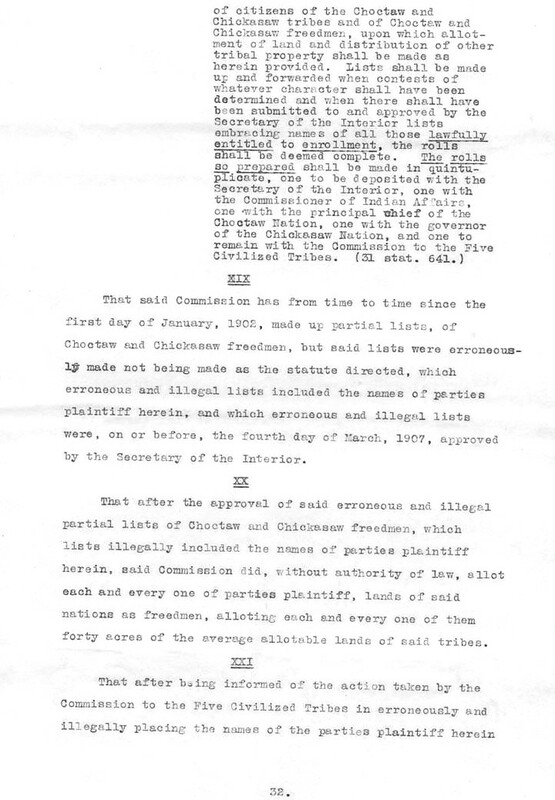 Dr. Daniel Littlefield, in his book The Chickasaw Freedmen, summarizes the case: "In April, 1907, attorneys for Bettie Ligion, A Choctaw freedwoman, and about two thousand other Choctaw and Chickasaw freedmen (mainly the latter) who claimed Indian blood filed suit in the U. S. Court for the Southern District of the Indian Territory against tribal executives and the secretary of the interior for an undivided interest in the Nations. 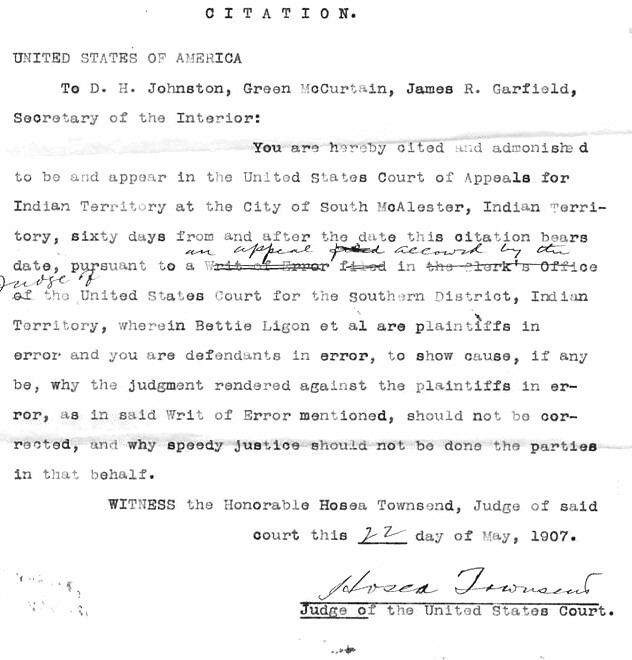 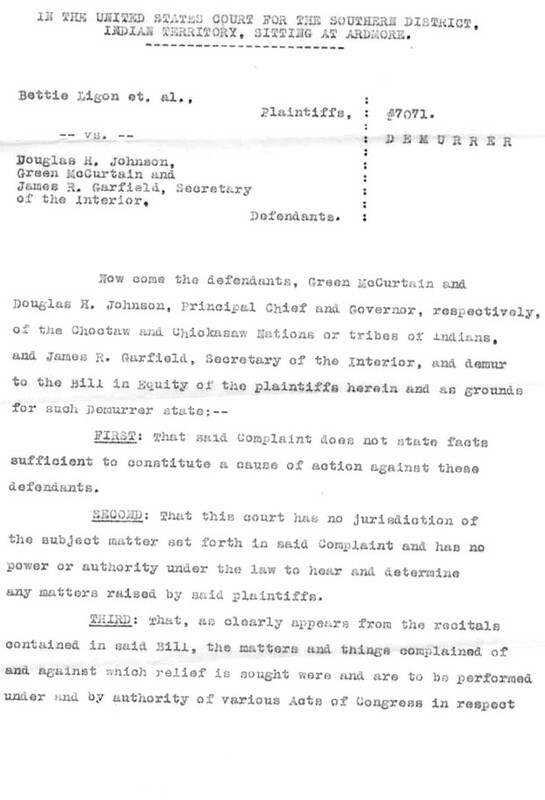 On May 18, Judge Hosea Townsend dismissed the case for want of jurisdiction. 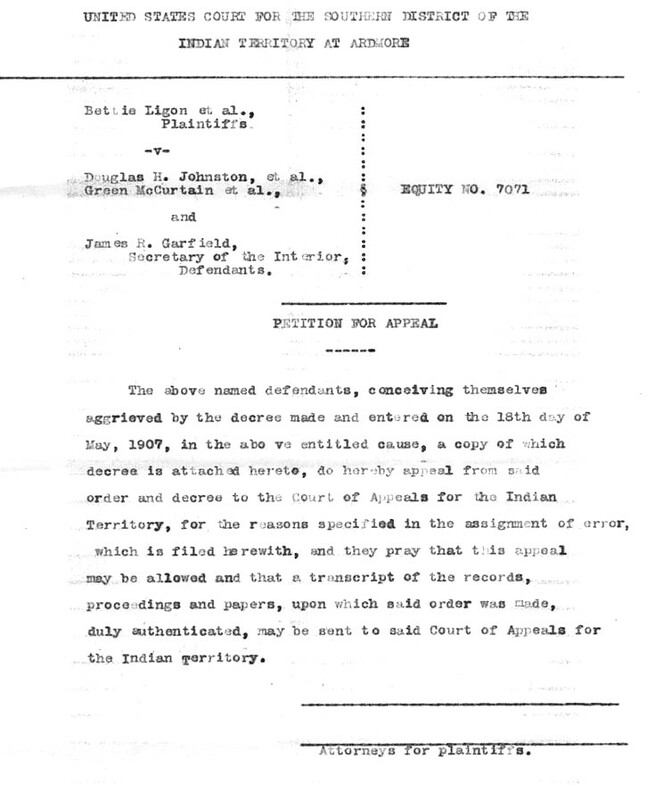 The court of appeals for the Indian Terriroty sustained the opinion because the judges could not agree on the decree that should be rendered. 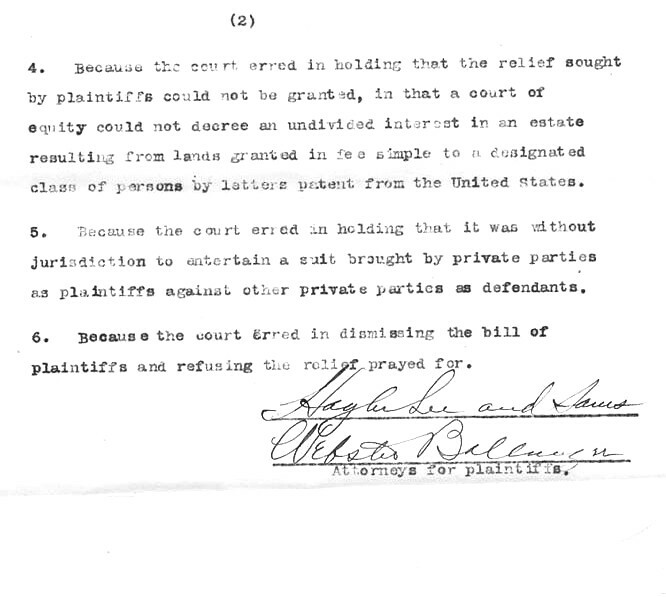 In June, the case was pending, on appeal, before the U. S. circuit court for the eighth district." 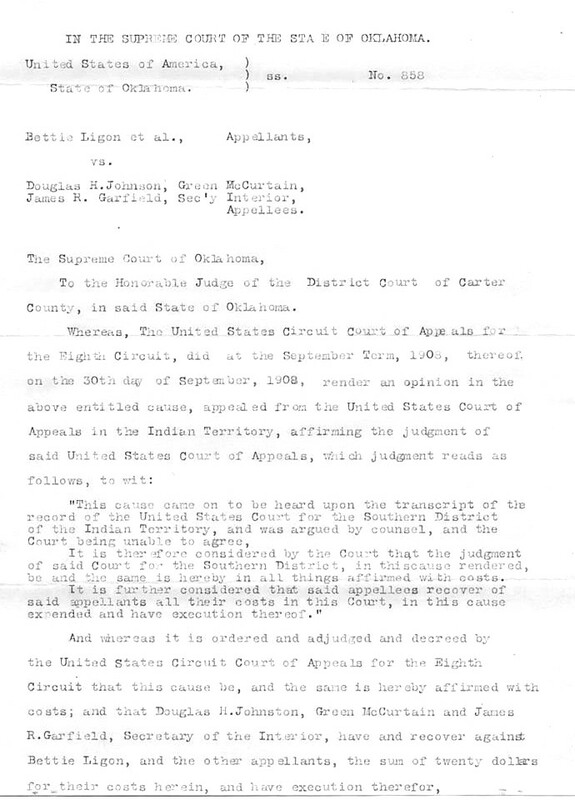 When the case appealed to the United States Supreme Court, it was dismissed late in 1911 because the appellants failed to file printed briefs. 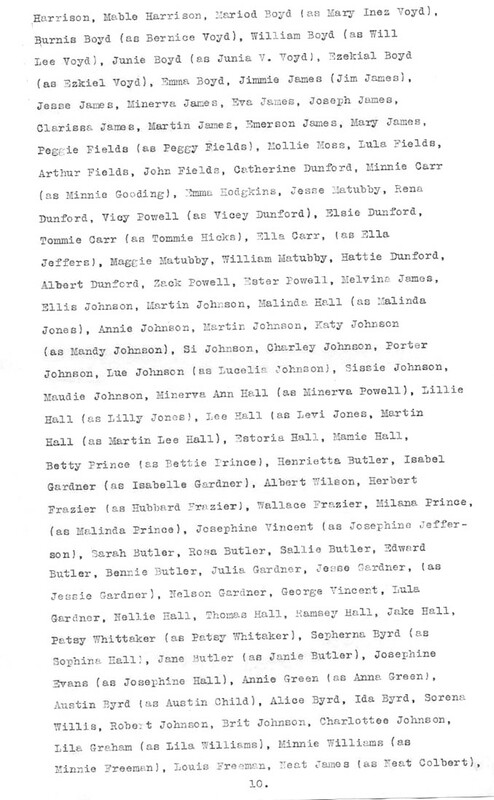 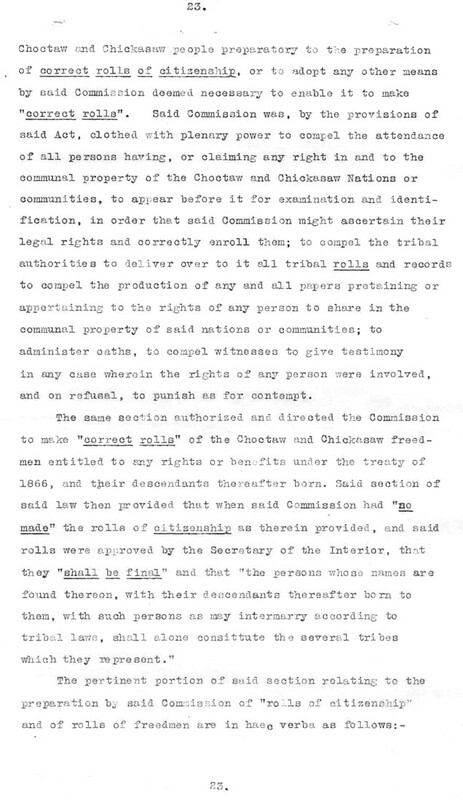 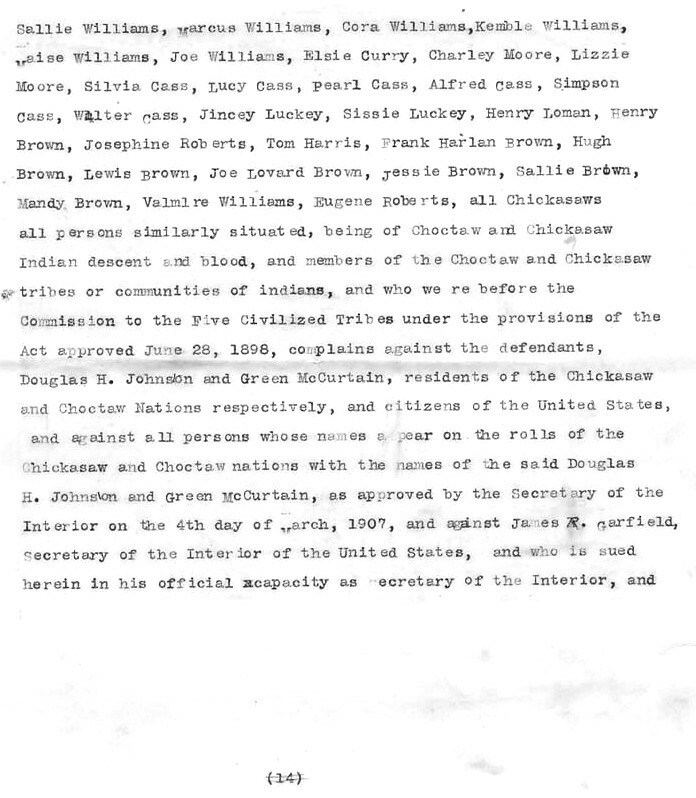 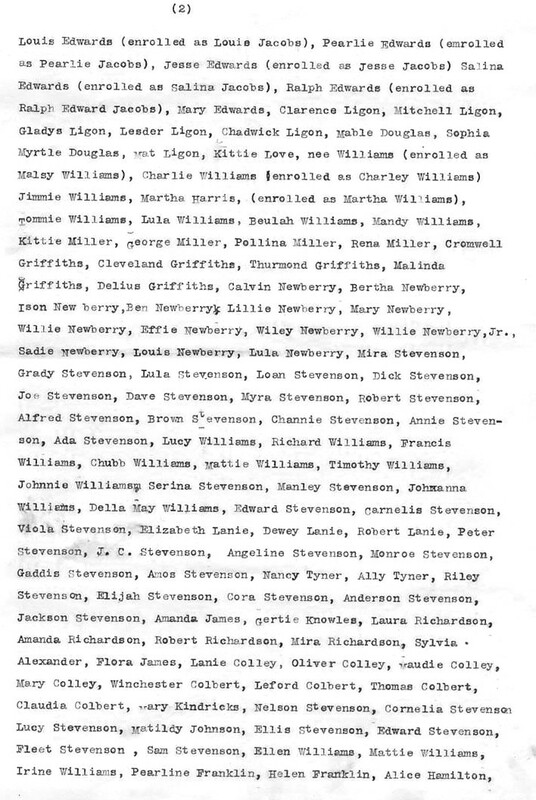 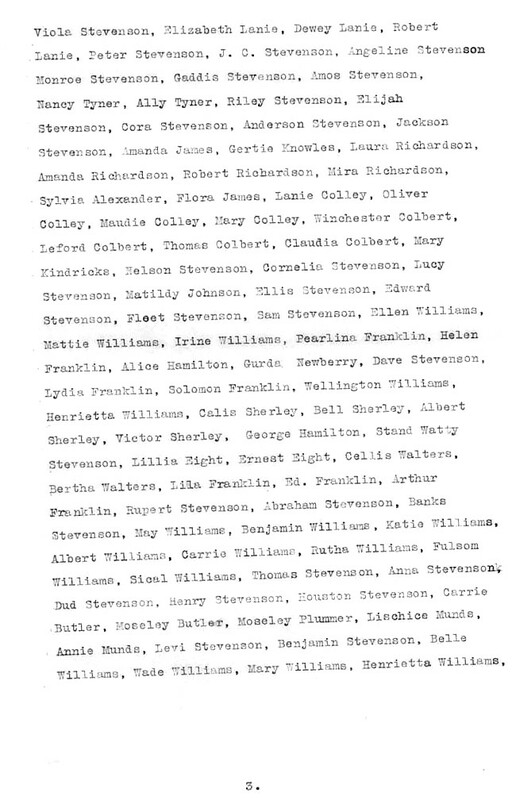 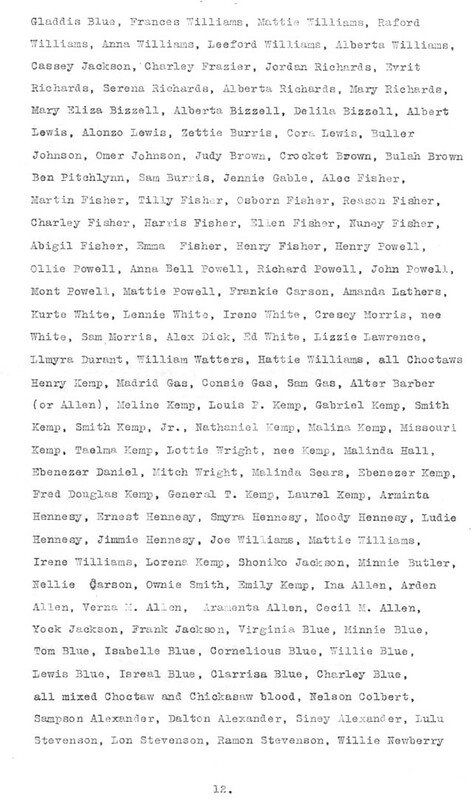 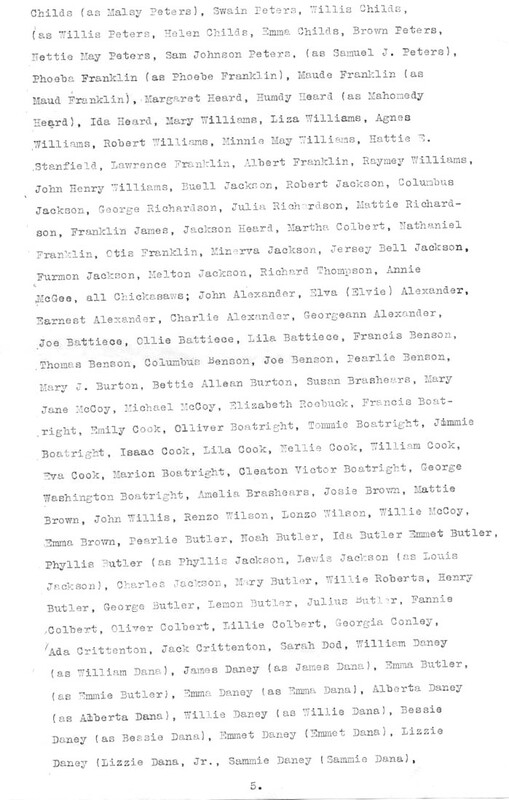 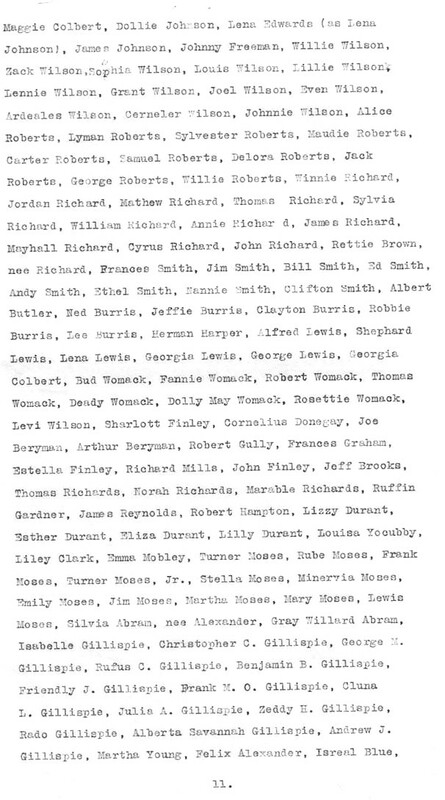 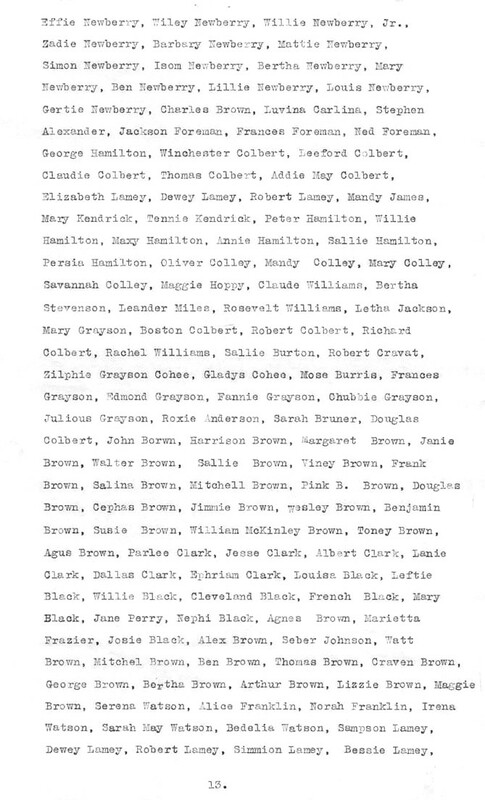 As late as 1928, Chickasaw freedmen were still trying to get their names transferred from the freedman rolls to the Chickasaw rolls." 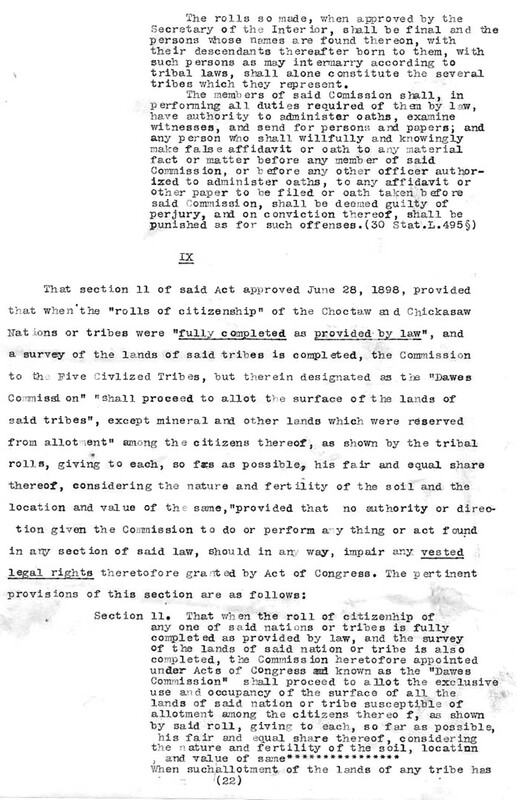 "By these actions, the United States excluded from Chickasaw Citizenship, forever, hundreds of persons who had more Chickasaw blood than many on the tribal roll. 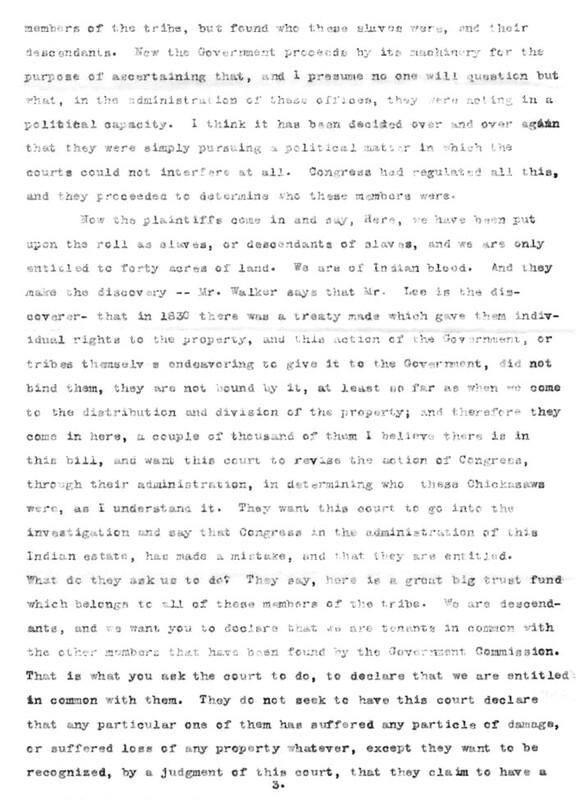 While it might be argued today that people of mixed black-Indian blood had as much right to be considered Indians as did the mixed white-Indians, the theory of "the one fatal drop" that characterized the racial attitudes in the white South prevailed. 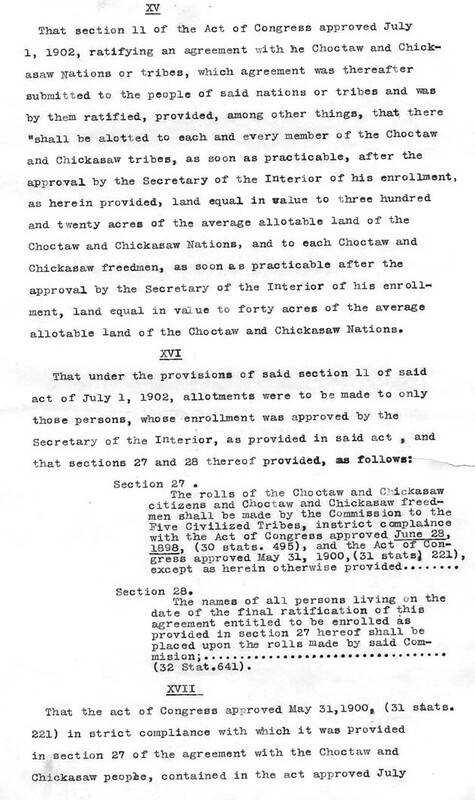 In rejecting the freedmen, the United States sanctioned the racial bias that had long existed among the Chickasaws. 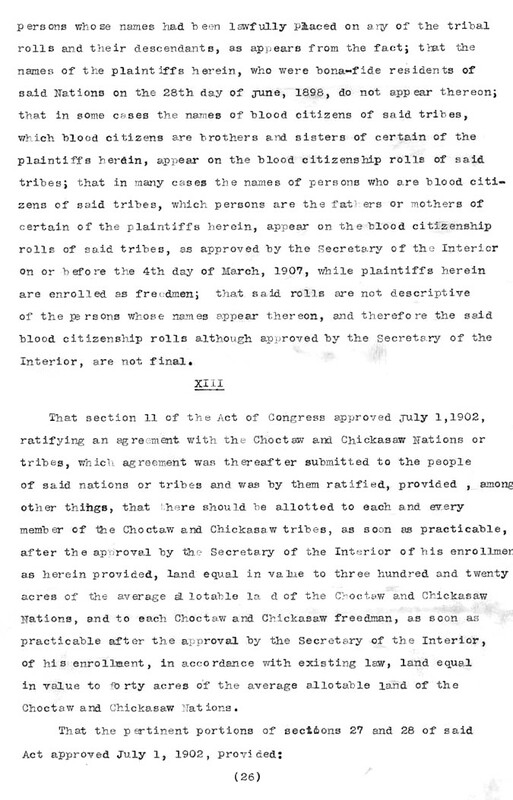 By refusing to rectify its error in not removing the blacks under the Treaty of 1866, the United States penalized the blacks for not removing on their own or for not voluntarily seeking American citizenship. 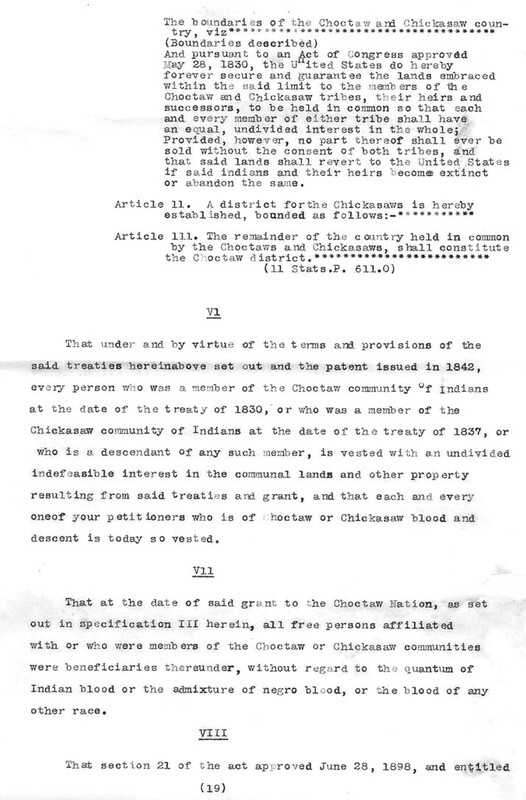 Thus the Chickasaw freemend lost the long struggle to secure rights in the Chickasaw domain. 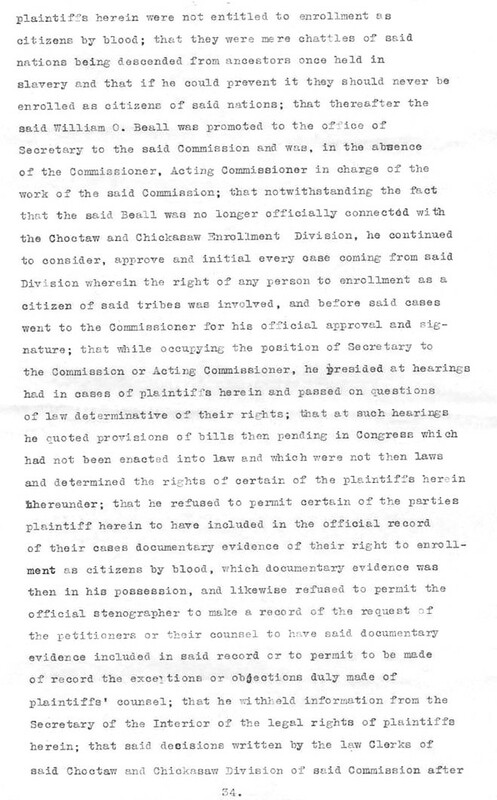 Whatever victory allotment may have been proved to be a hollow one. 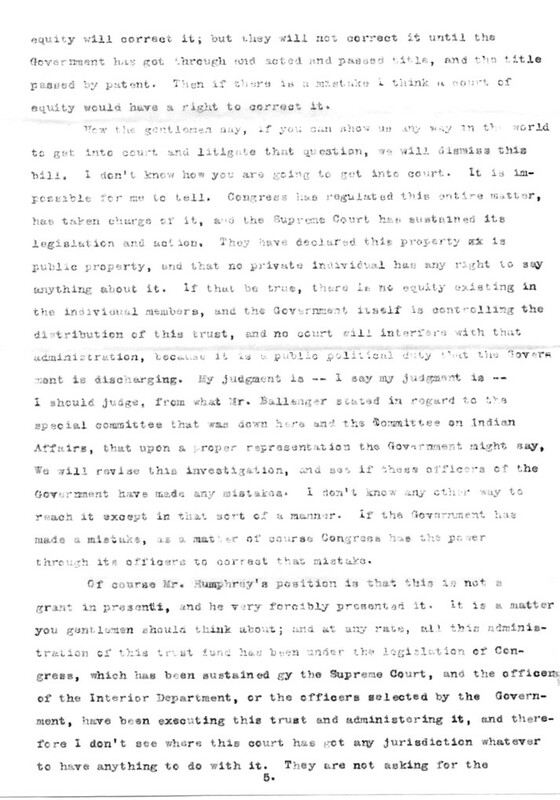 As citizens of the new state of Oklahoma, they would find that their lot was not greatly improved."